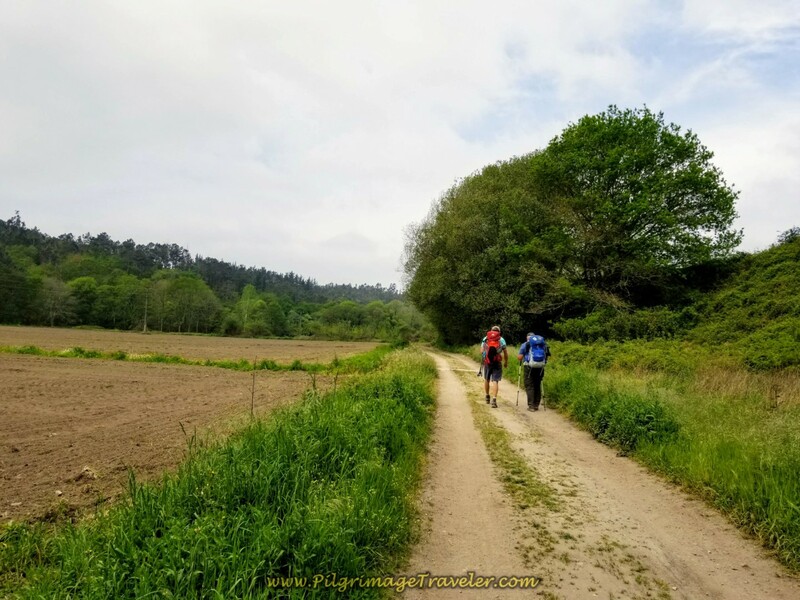 Day one on the Camino to Finisterre, after leaving Santiago de Compostela, is a beautiful Camino through an enchanted forest, medieval towns and gorgeous countryside. 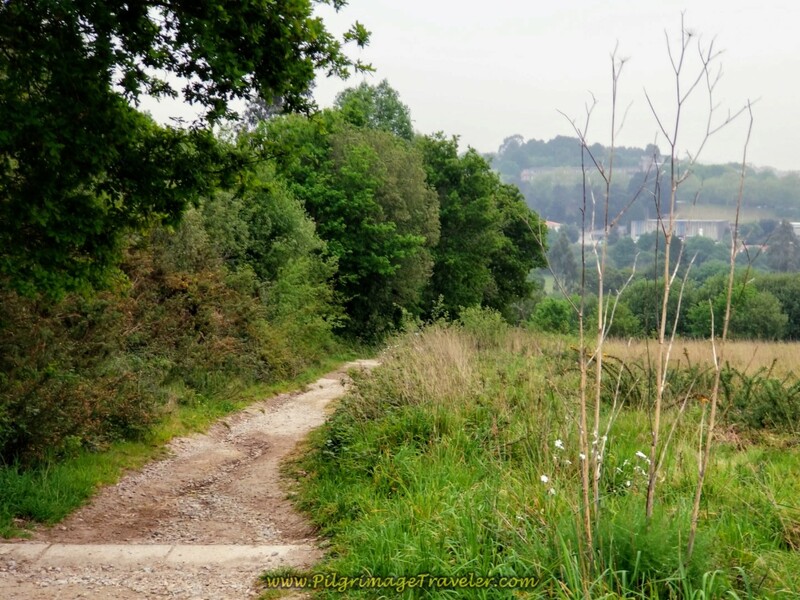 After walking this way several times, I continue to find it enchanting, and even, perhaps my favorite Camino! 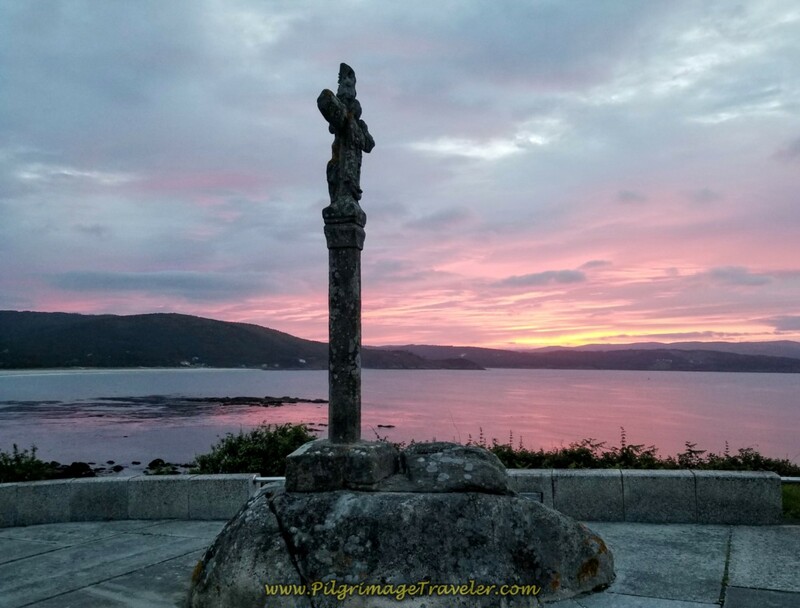 There is something special with the Camino de Santiago a Fisterra that never ceases to draw in the pilgrimage traveler. Perhaps it is the mystique of continuing this ancient pagan tradition to walk to the End of the World. Here is our Google map of the day. I added accommodations, cafés and supermarkets along the way for your reference to help you plan your day. 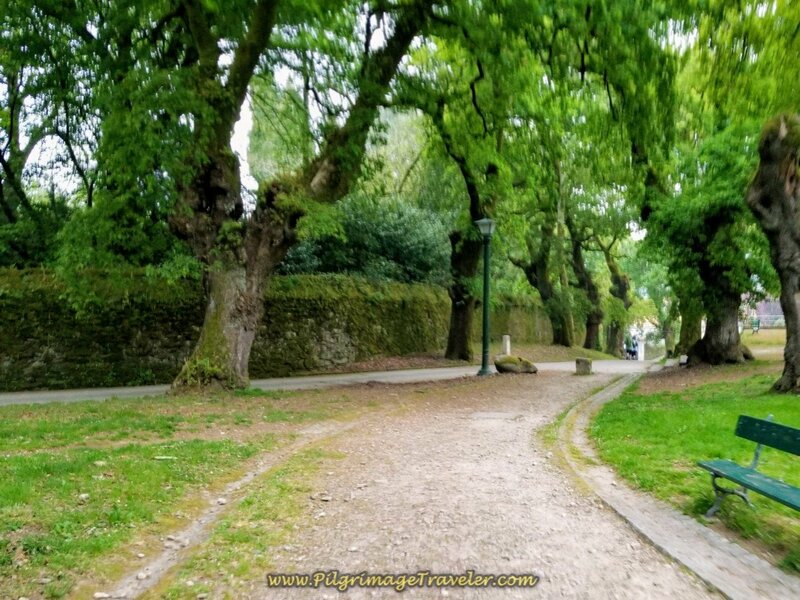 I did not place accommodations nor cafés for Santiago de Compostela, in the city proper, as these are so numerous! If you are seeking advanced reservations for Santiago, which I definitely recommend you do, click here. If you are seeking reservations for Negreira, click here. The actual day one of the Camino Finisterre is not too difficult, as as you can see from our elevation profile below. The elevation map shows very little change in elevation and the first part is an ambling up and down. 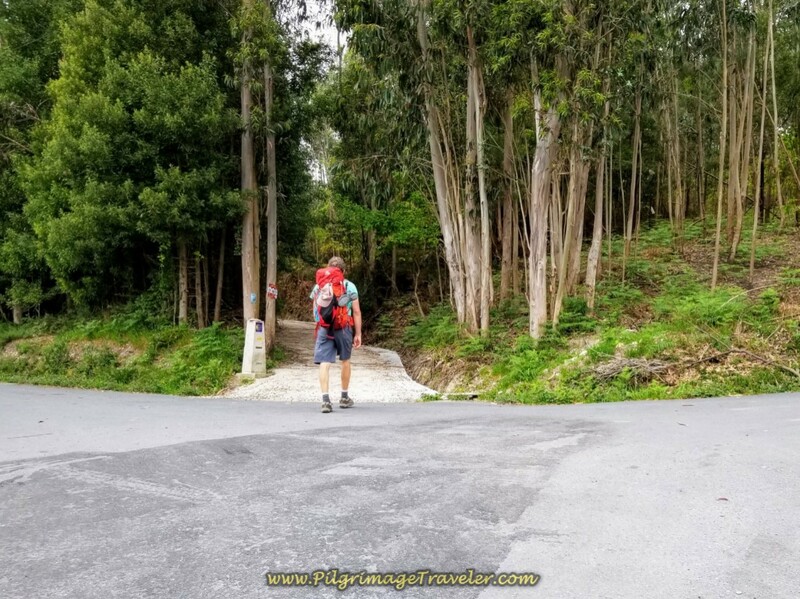 There is a long hill climb out of Aguapesada of about two kilometers and 200 meters of elevation gain (650 feet) that you will feel. It only took us about a half hour to complete and is the most strenuous part of the day. You can do as we did, and stop for a break in Aguapesada, having coffee and a snack to help power you up the long hill! Because the day is only 21 kilometers, we felt it was quite manageable. 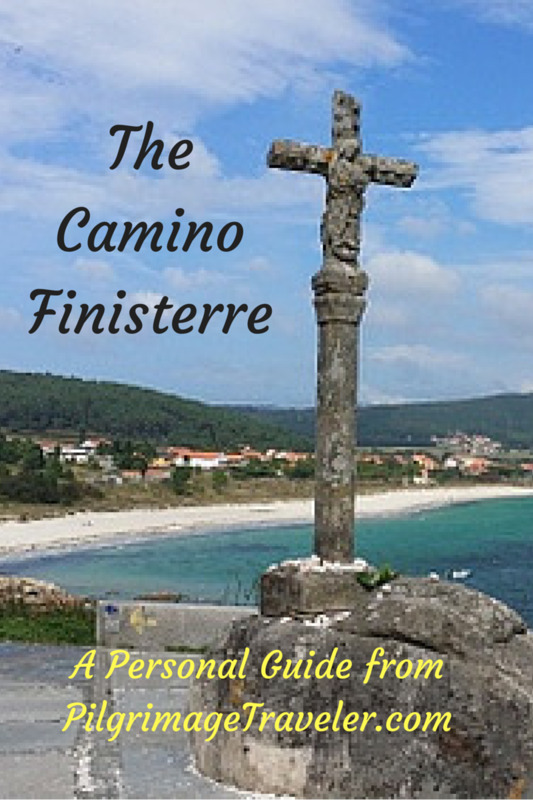 We had scoped out The Way to Finisterre and its start, the day before, so we were all set. 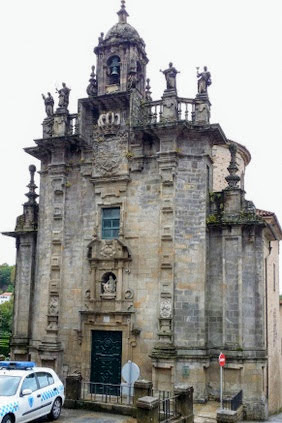 The Way starts in the northwest corner of the Plaza do Obradoiro, on the west side of the Cathedral de Santiago. 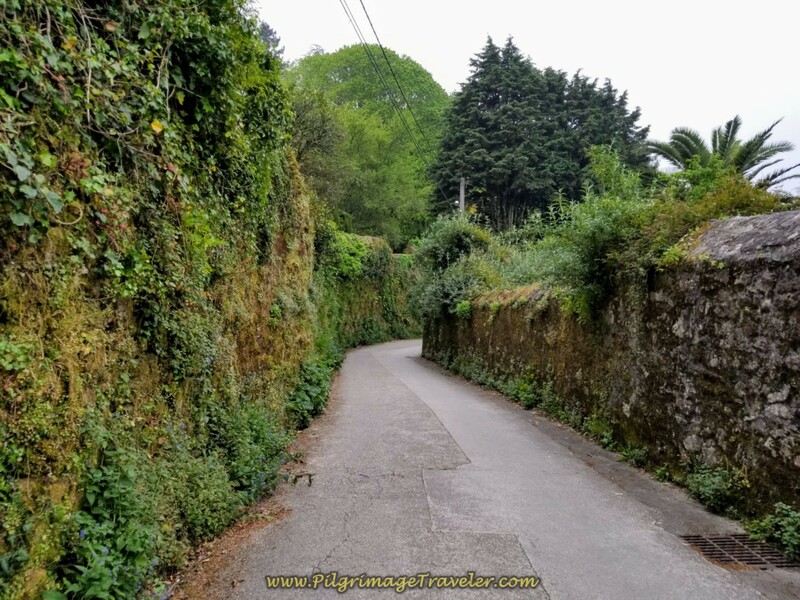 The first steps you take are down the Rúa das Hortas, shown below left. This is how it looks as you leave the plaza by the Parador. At the bottom of the ramp, you will see the Igrexa de San Frutuoso church on your left, by a police station. You can see a police car parked in front of the church, below right. This is actually the same street than you would take to walk from the cathedral to the Pilgrim's Office. Instead of turning right towards the Pilgrim's Office, continue onward for about one third kilometer and come to the first intersection, shown below. Many roads come together here and it's imperative that you get the right one. It is a bit confusing. Go to the left, and up the hill a bit, crossing the crosswalk straight onward. 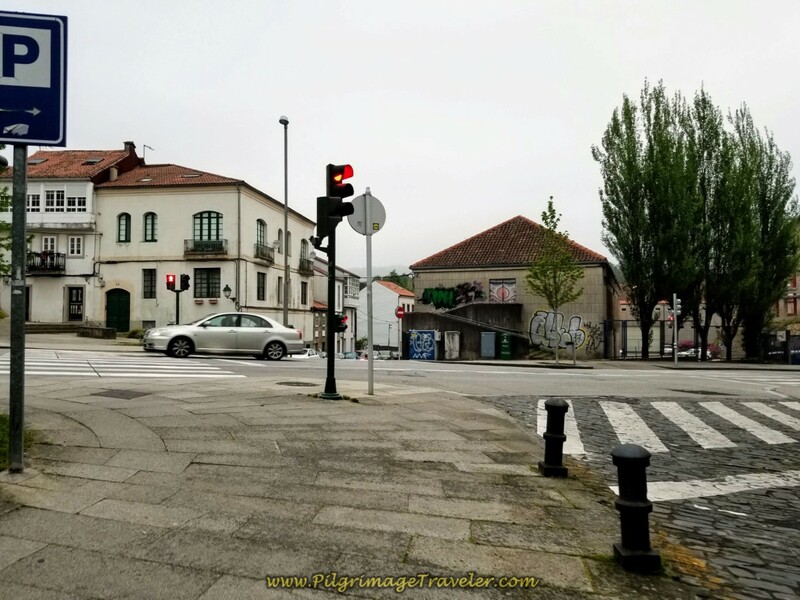 You can see the street name on the white building, called the Rúa do Cruceiro do Gaio. This is the street you want. This is how the correct street will look below. Continue on this street for one-half kilometer, as it changes names several times walking through Santiago. If you are looking for breakfast, we passed by several open cafés at 7:30 a.m., along these streets in Santiago. 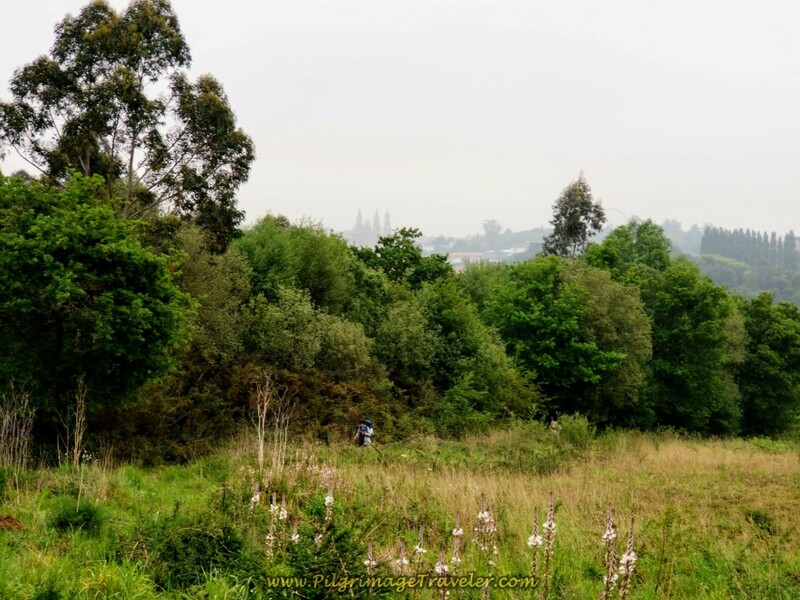 After you leave the city the way becomes quite rural and there is nothing until 6-7 kilometers into the day, at Os Arcos. (See below). After walking the 1/2 kilometer, come to a small park at a large intersection. 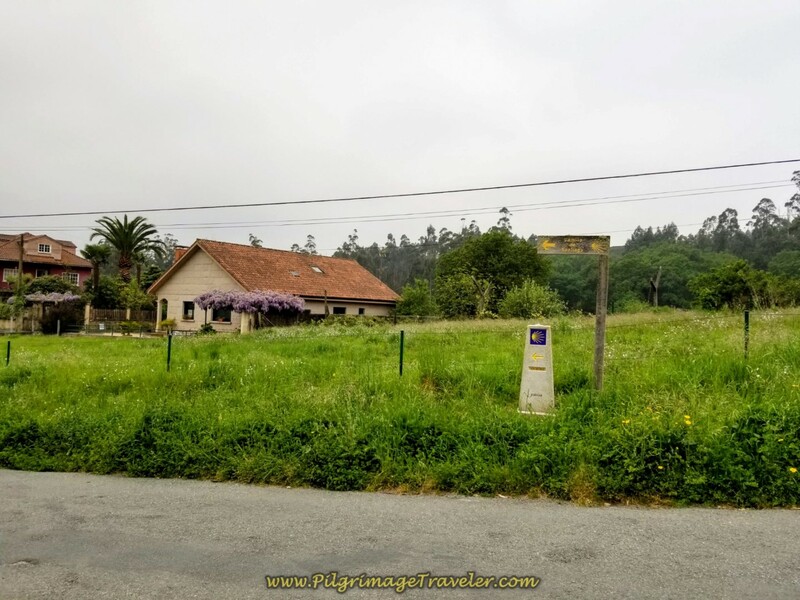 Here you will see the first prominent waymark on day one on the Camino Finisterre, shown below. It is 89.536 kilometers to Fisterra and 86.482 to Muxía (pronounced moo-SHEE-ah). 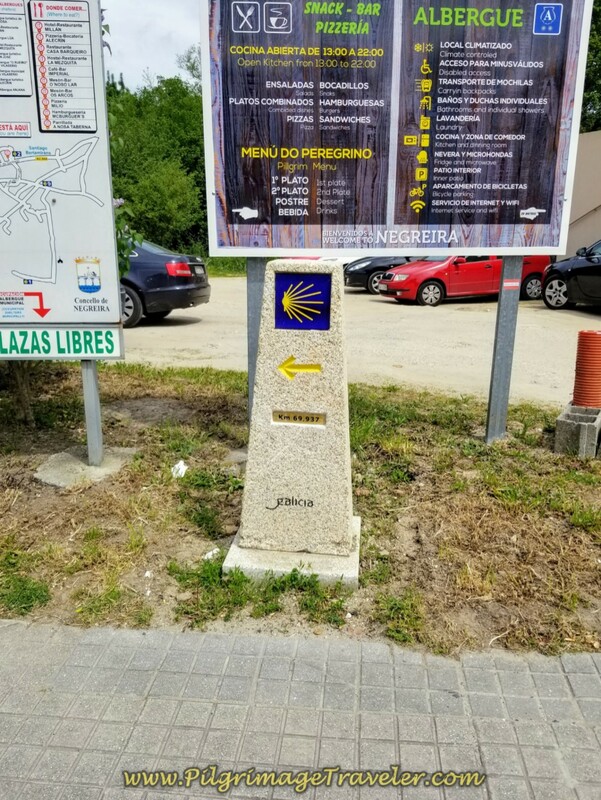 All of the kilometer markers are brand new on the Camino Finisterre, and the distances have changed from when I walked here last. 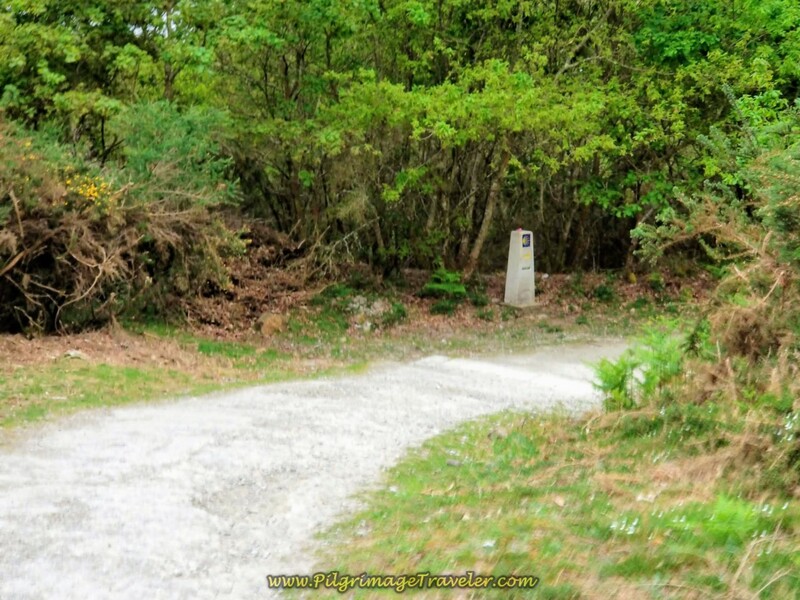 It used to only give the distance to Fisterra, and this marker previously stated that it was 88 kilometers to reach it. Maybe the distances are actually accurate now? 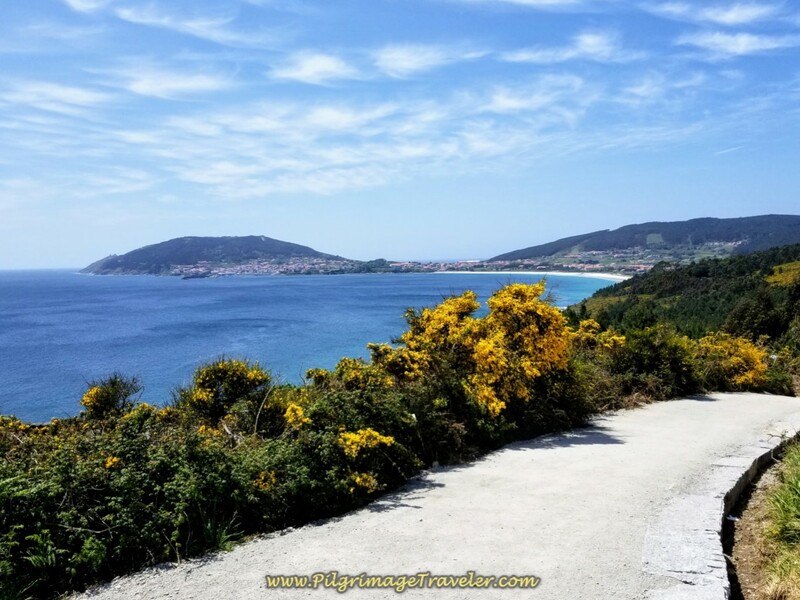 Regardless, we had already walked almost a full kilometer from the cathedral, so by my math, it is at least 90 kilometers to Fisterra! Cross the intersection towards the kilometer marker and walk through the park shown below. 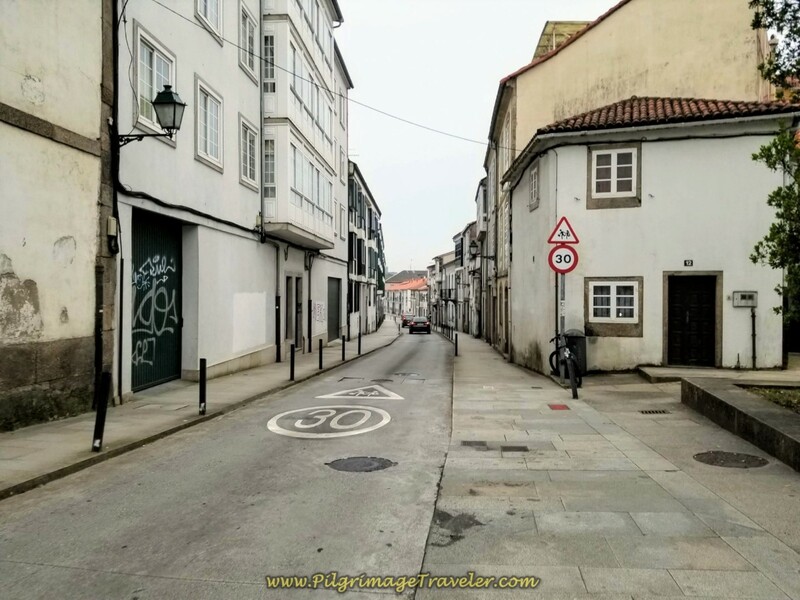 Turn right at the end of the walkway and pick up the Rua Carballeira de San Lourenzo. Continue on the street for only a few meters, coming to a T-intersection. 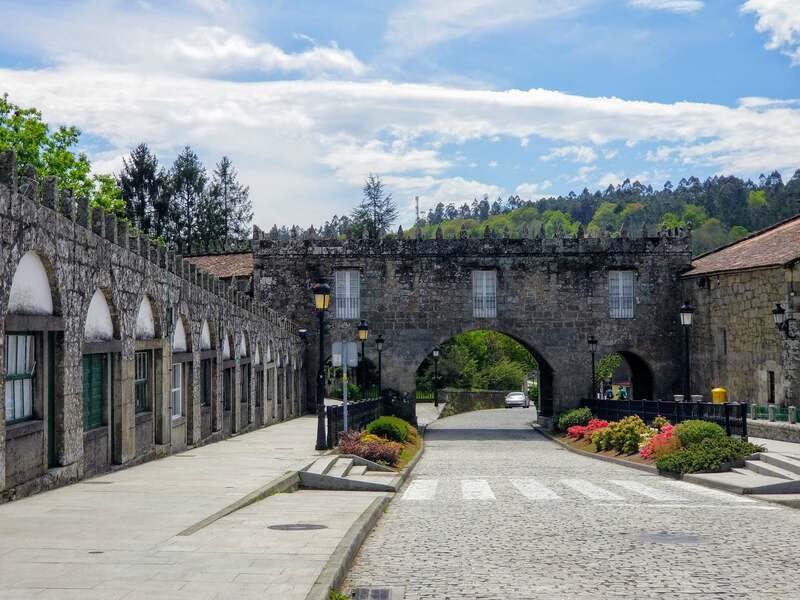 Turn left onto the quaint street, the Costa do Cano, shown below. Is this from Lord of the Rings or what? In 1/4 kilometer, come to this distinctive waymark, painted on the bridge, the Ponte Sarela. The kilometer marker says 89.173. Cross the River on the old bridge, and immediately after, the Way turns to the left. 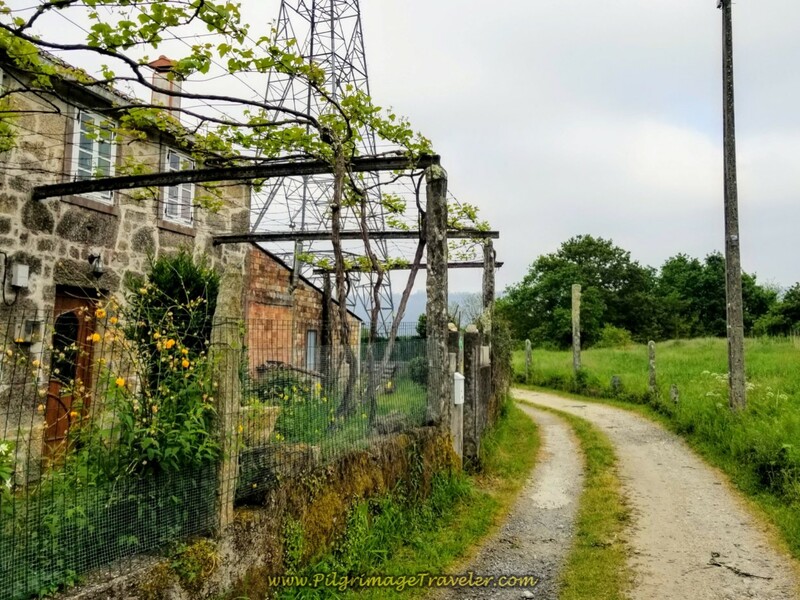 If you stayed straight on after the bridge and walk only a few meters more you will come to the Casa Ponte Sarela, a rural home that may be a nice alternative to staying in Santiago city center. In only a few meters beyond the bridge, the road stays low at a Y-intersection and becomes a path. Soon after joining the path, we stumbled onto a tent, camped along the path. It seems like there is always a requisite beggar who puts his bowl out by his tent in this section! 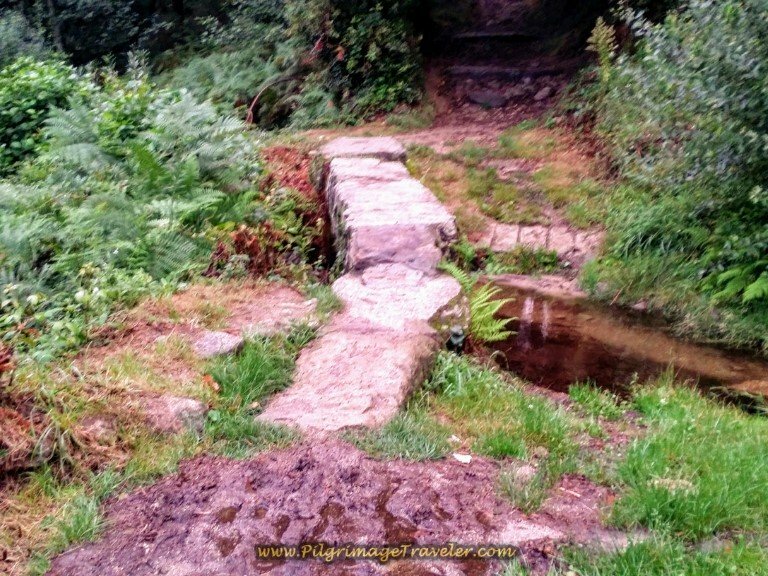 The path descends to cross a small stream on pavers, below, then starts to climb for approximately 3/4 kilometer, up and out of the Sarela River valley. 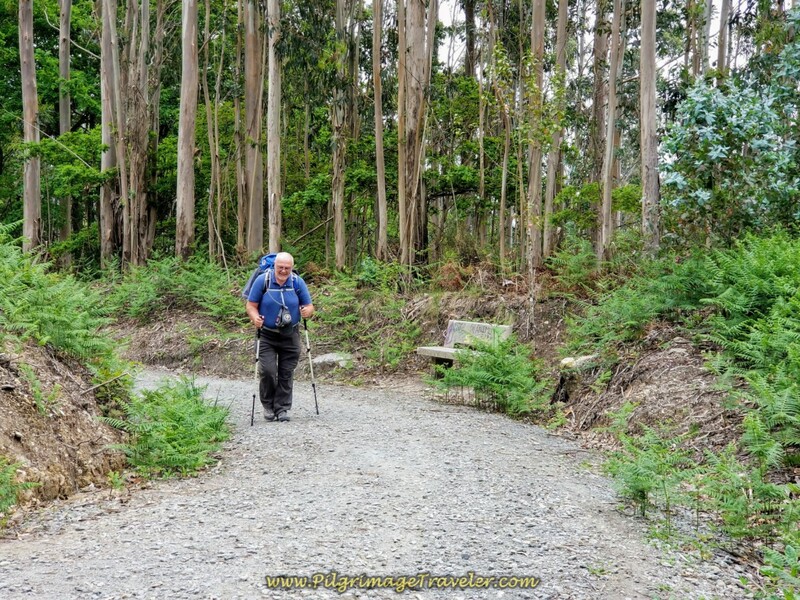 Here is a photo of a pilgrim coming up this path, as we looked back over our shoulders. There are glimpses of the Cathedral in Santiago opening up! 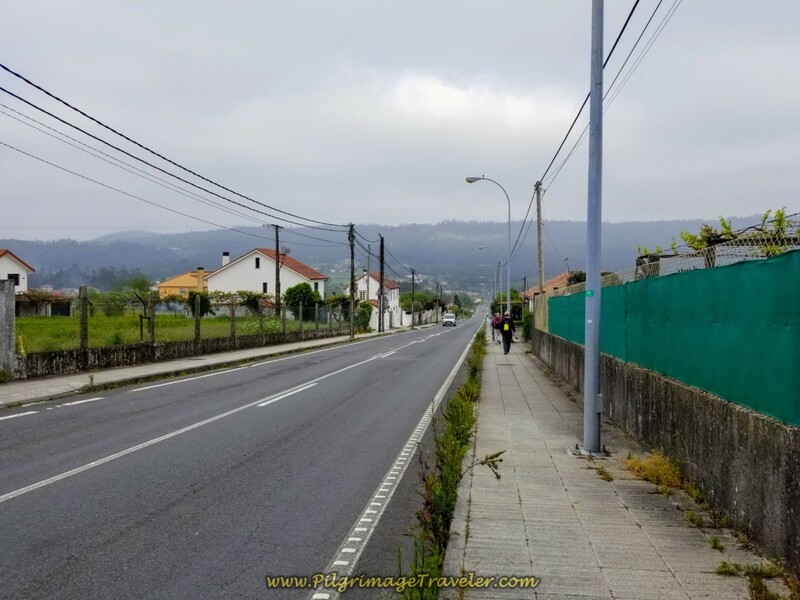 Our day one on the Camino Finisterre was very misty as you can see, so you can barely make out the cathedral towers. 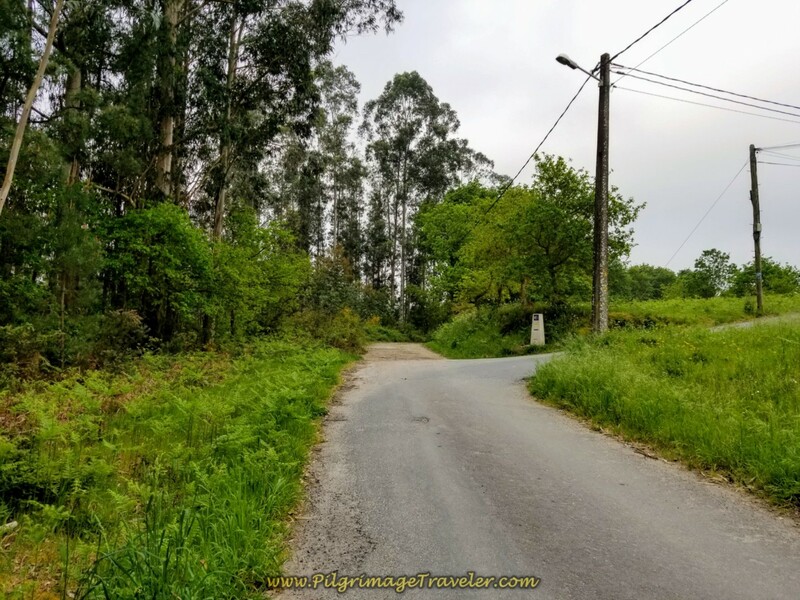 The path ends at a T-intersection, shown below, and you turn left onto a high plateau road, the Rúa Sarela de Abaixo. 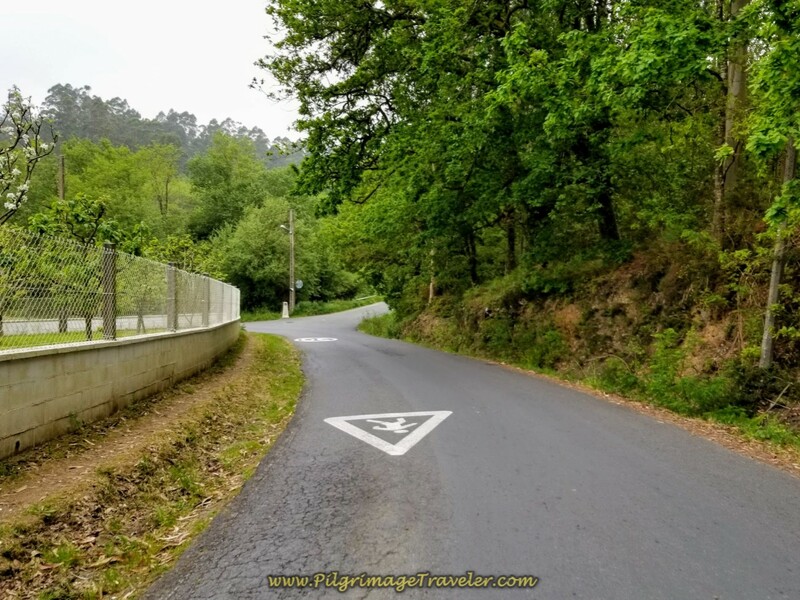 If you were to turn right here, in only a few meters up the hill is another accommodation near Santiago called the Sarela Apartments. The place looks like a lovely alternative to the city! 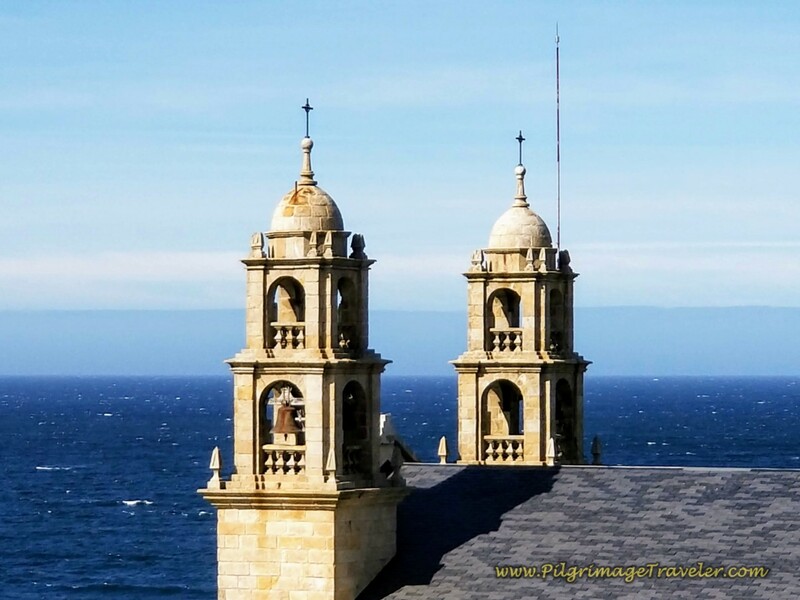 Make sure you look back towards Santiago as you walk through here, as the views are stunning. May you be blessed with clear weather to see them! 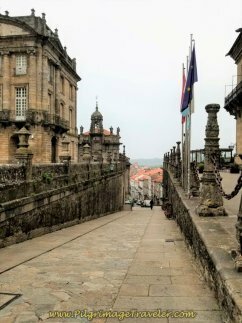 A truly magical moment occurred as I climbed out of the city of Santiago de Compostela in 2014, my first time through here. I looked back at the roof of clouds that prolonged the sunrise. This vista below, was brought before my eyes, so very stunning in the light that framed the cathedral to perfection. What a treat! The glory of the Earth never fails to enthrall me! Our second time through, we were not so lucky, as it was very misty and difficult to make out the cathedral at all. Walk down the hill a few hundred meters and come to the next turn to the right, onto a country lane, shown below. 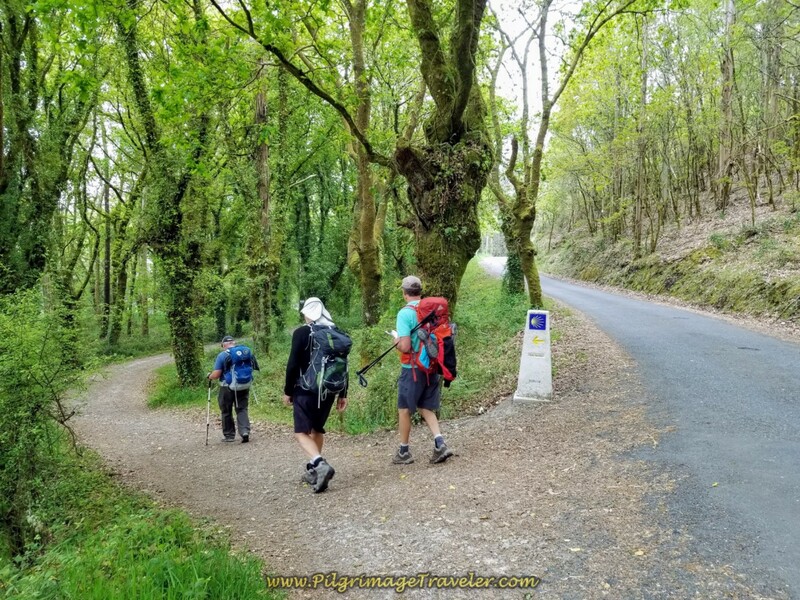 The double waymark was a common sight on day one of our Camino Finisterre. See the old wooden one, and the brand new concrete pylon? It truly was very difficult to get lost. 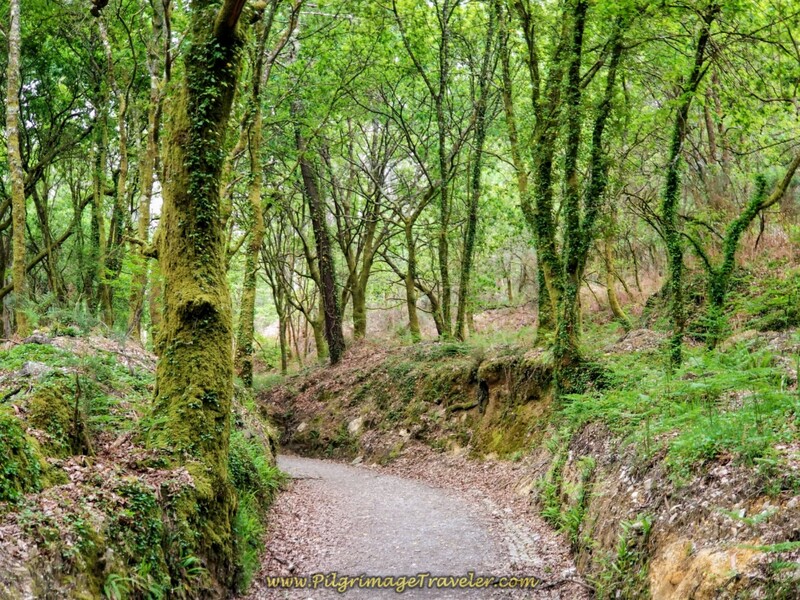 In a few meters, the lane becomes a forest path, quite lovely and shaded. We followed this path for a full 1.4 kilometers. You will encounter lots of kilometer markers along this way. The trail descends quite steeply on gravel through here, so be alert and use your poles if you have them! 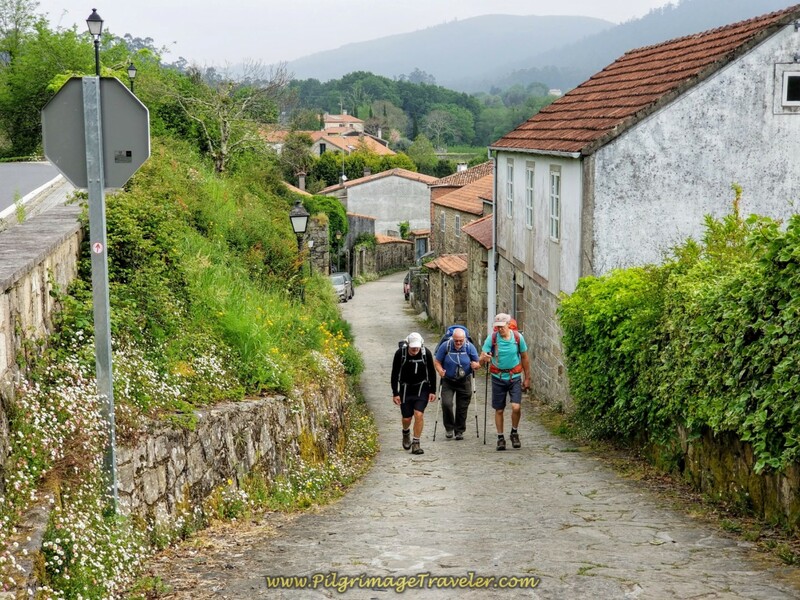 After 1.4 kilometers of walking, the path comes out at road, and the Camino leads you right onto this pavement called the Moas Abaixo. 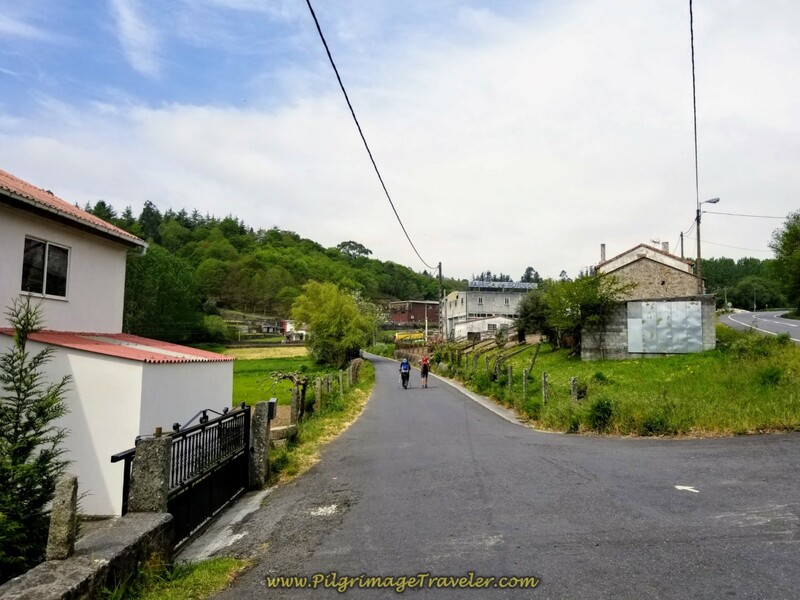 After returning to the pavement, the Camino meanders through the countryside, for more than 2.0 kilometers on more quiet roads skirting the next town of O Carballal, shown in the next photos. 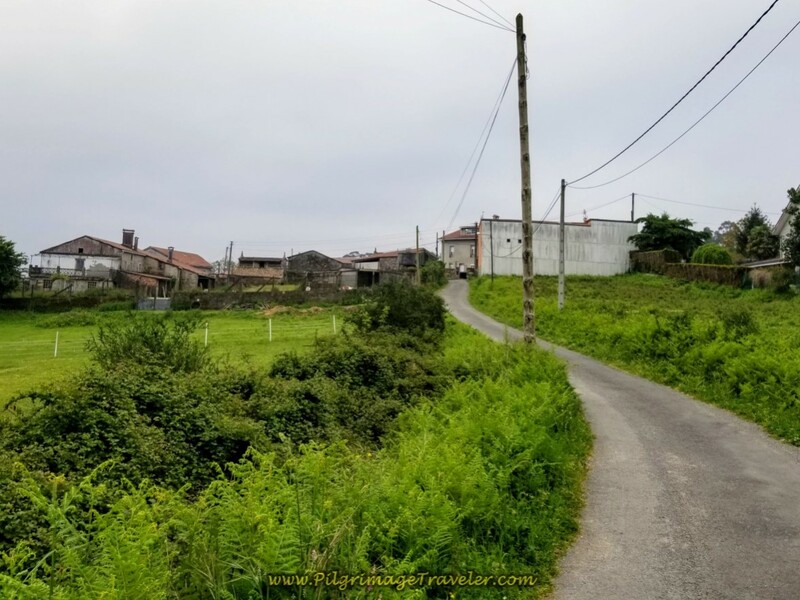 In the final 150 meters of the pavement meanderings of about 2.0 kilometers total and after the turn above at the horreo, you come to an intersection, where you walk straight across the road and onto the second pathway system of day one on the Camino Finisterre. You pass by the 84.482 kilometer marker, shown in the photo below. Five kilometers down, 15 left to go! There is a sign for the Café Os Arcos as you enter the trail system. It is about a kilometer away in the next town of Roxos. 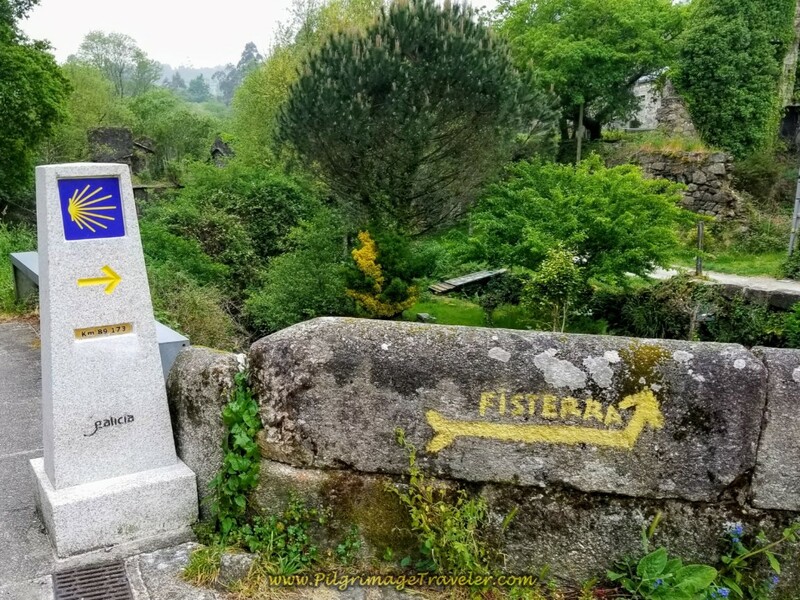 This is your first opportunity for coffee and a bite to eat on day one of the Camino Finisterre. 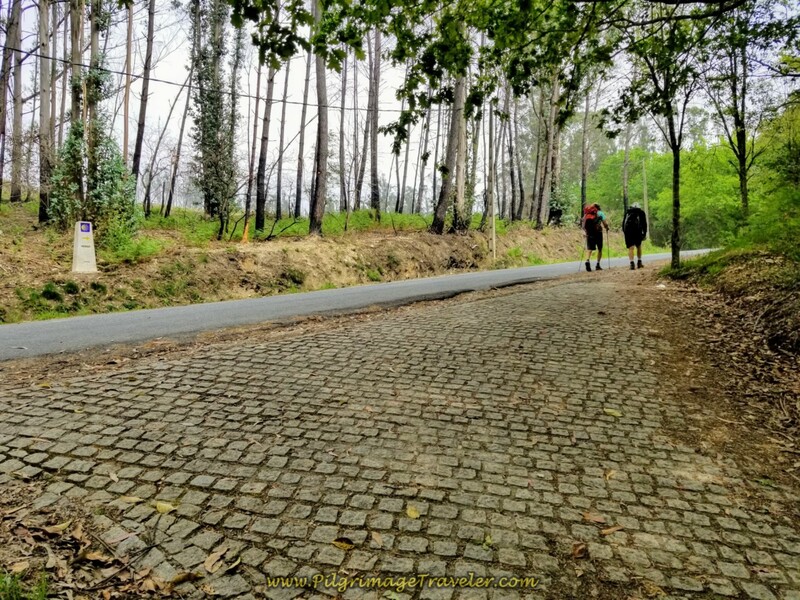 After 3/4 kilometer in the forest, the Way turns to pavement again and walks toward Roxos. 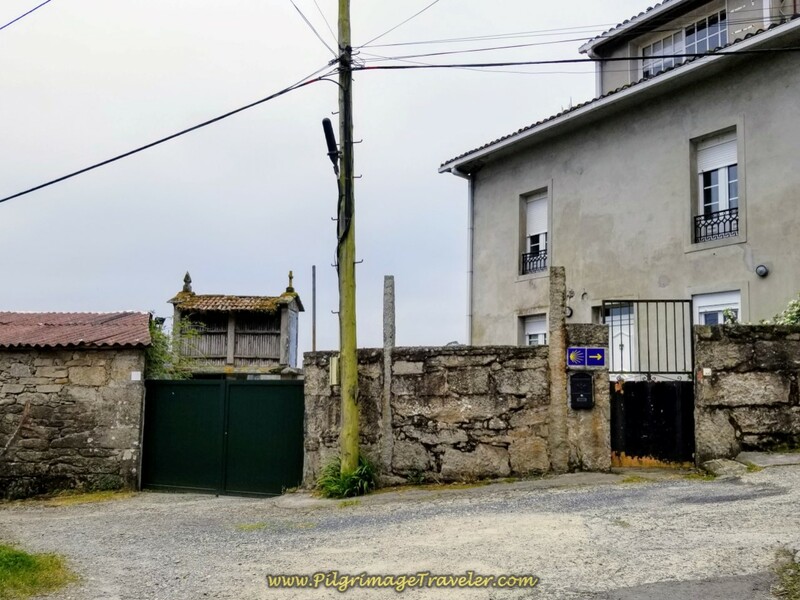 It is another 250 meters, at the blue house, below, where you turn to the right for the Café Os Arcos, a few meters off the Camino. Just follow the signs. Rich and I said, "Sure! Let's get another café con leche!" It was a shorter day and it is not quite a third of the way into the day at the Café Os Arcos. We were also hoping to hook up with our friends Rob from Australia and Steve from the UK, who had gone on before us. But they were not there. Most likely they were still ahead of us. 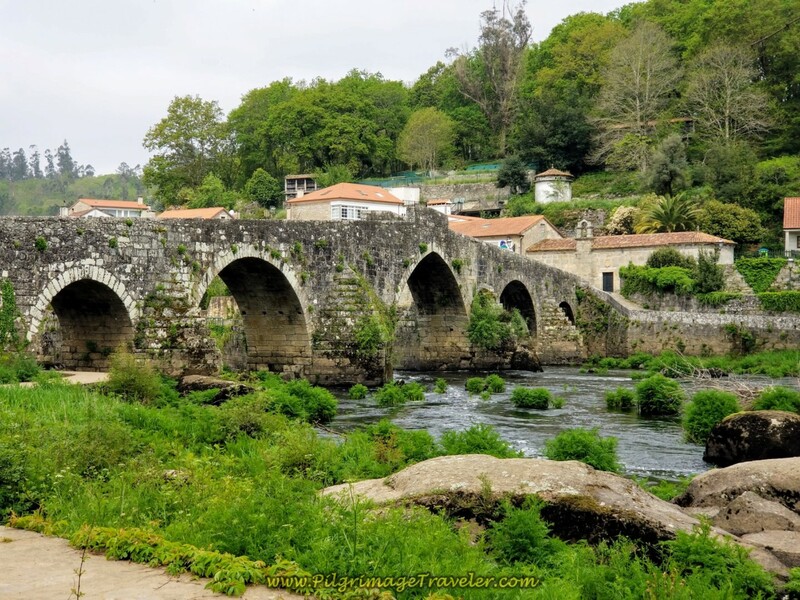 Since the short climb out of Santiago, the Camino is essentially downhill to the Os Arcos. I continue to be fascinated by palm trees in Galicia, and there is a lovely one next to the blue house. The Way actually goes to the left at the blue house, then an immediate quick right to walk through the village of Roxos, shown below. 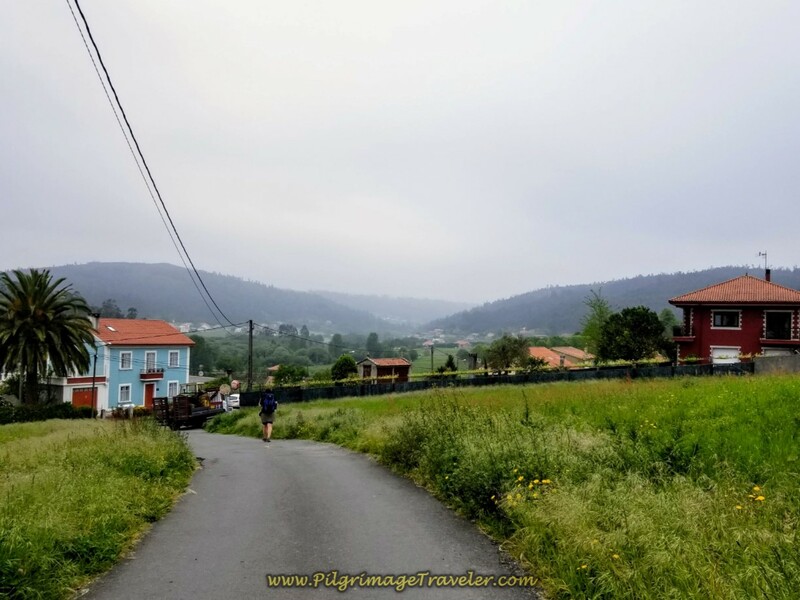 You could stay straight on at the blue house, heading south into Roxos proper on the CP-7802 for 600 meters to find two available accommodations, the Hotel O Desvio and the Hotel Asador de Roxos Casa Albardonedo. See our Google map above for their exact location if you are in need of a place to stay when you arrive here. Otherwise you wind around through the streets of the village and in 600 meters from the turn at the blue house, you enter the forest again and come to this lovely shaded picnic area, below. 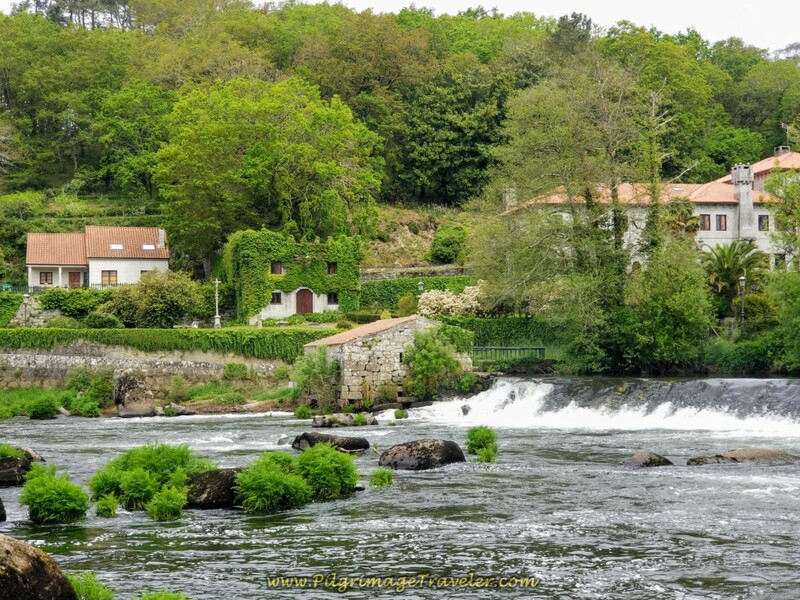 This is where the Camino crosses the river called the Rego de Roxos. It would also be an inviting place to rest and have a snack. 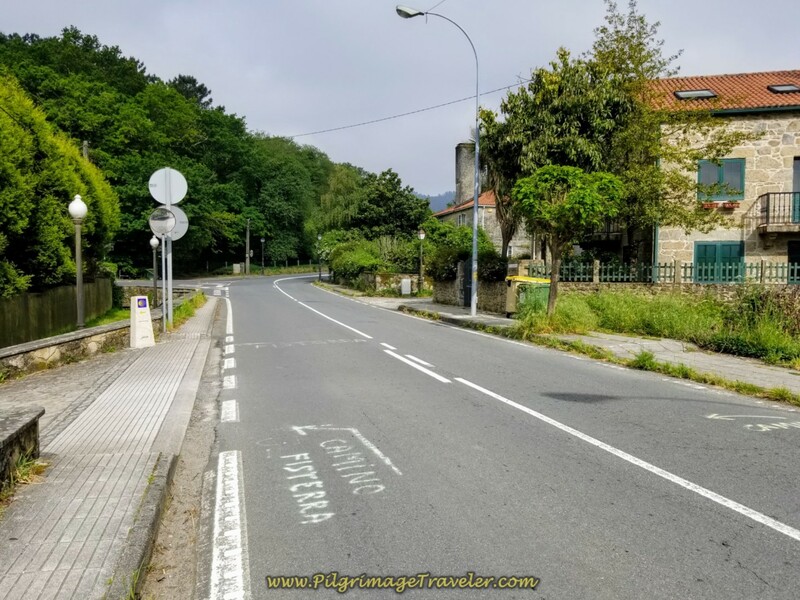 Shortly after the river, the Camino reaches a Y-intersection, where it stays to the left, continuing on quiet roads. 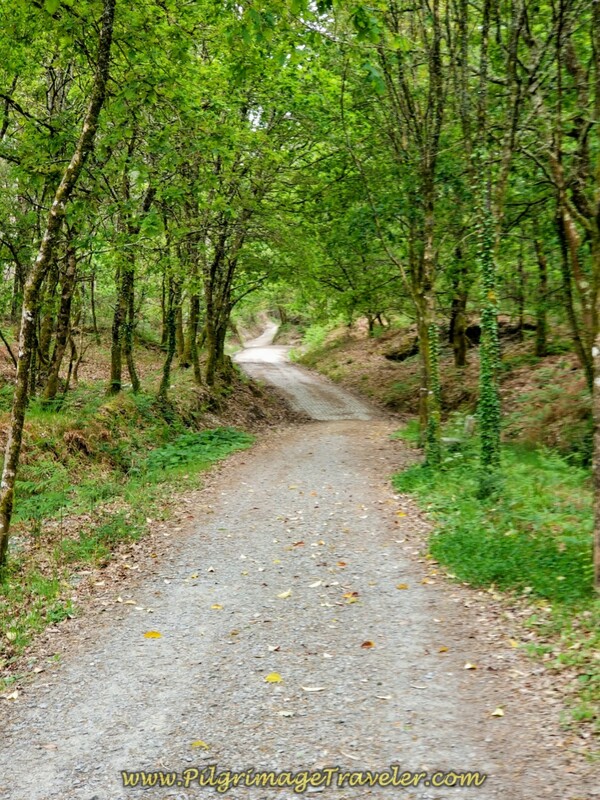 Eventually the road gives way to a lovely path that takes you onward through the shady forest. 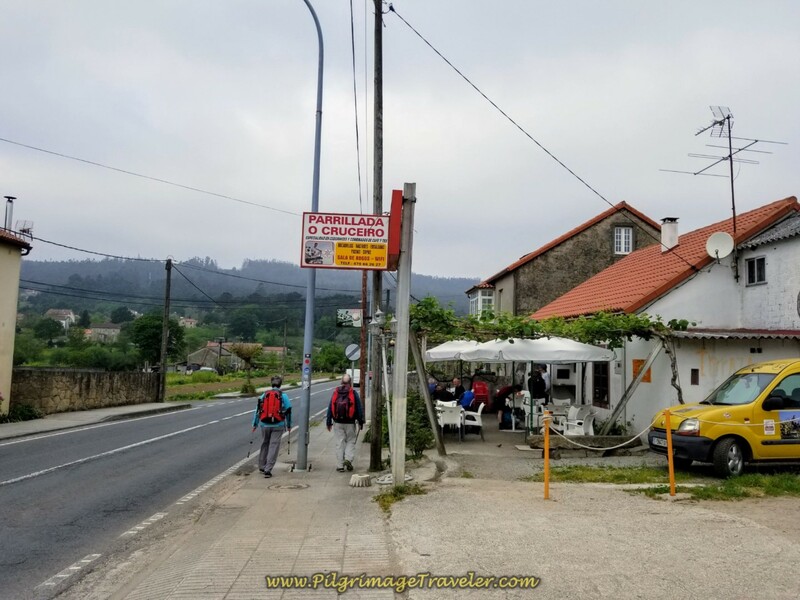 After about 1.3 kilometers through the forest, the path rejoins the pavement and comes to a T-intersection with the AC-453 at this restaurant, the Mesón Alto do Vento, shown below. As you can see it was closed when we walked by in the morning. I would not count on it being open until later in the day because it is a restaurant, not a café. We turned right here onto the AC-453 for a 600 meter walk on nice wide sidewalk toward the next town of Ventosa. 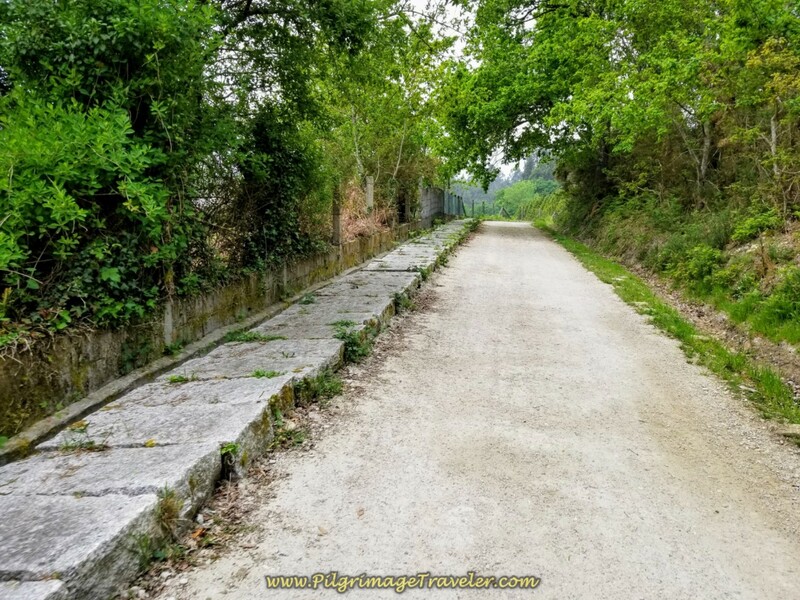 After the 600 meters walk, the Way directs you to the right on a side road in Ventosa, avoiding the AC-453 for another 700 meters, despite crossing over it about halfway through. 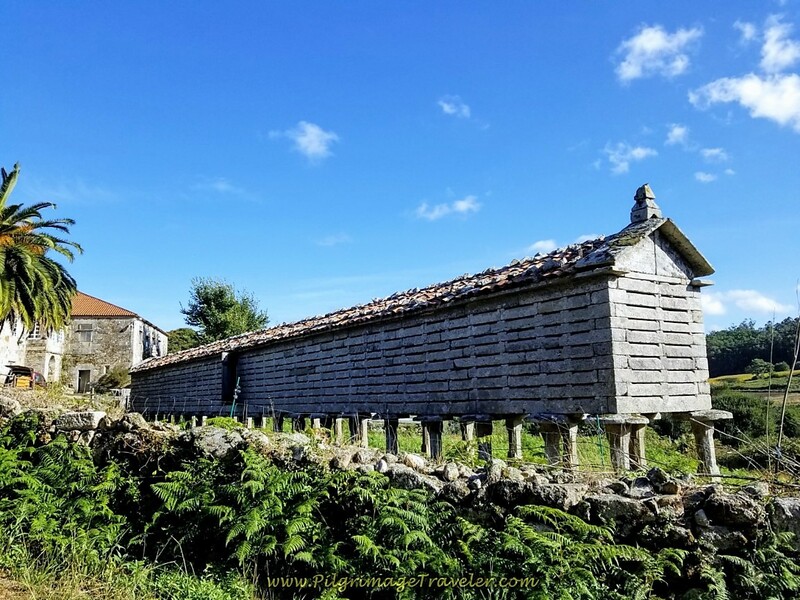 As you walk through Ventosa, pass by this horreo, below. 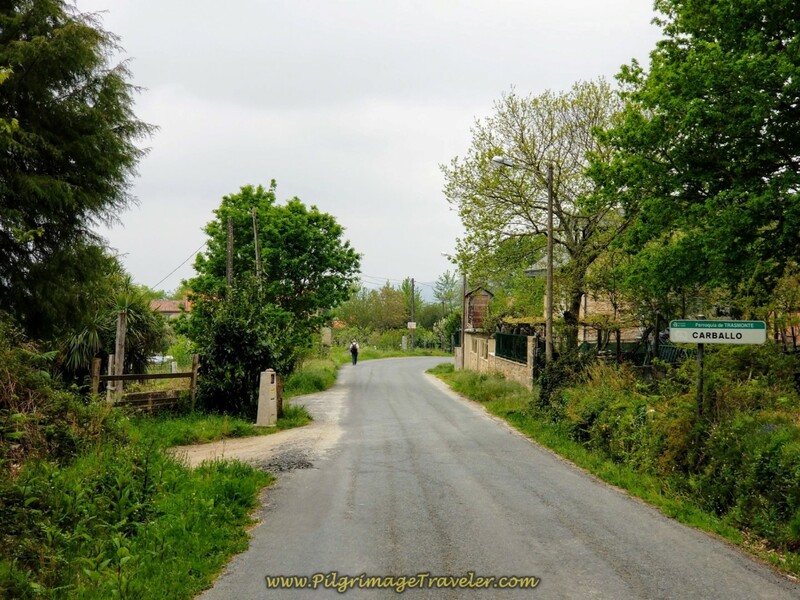 A few meters after passing the horreo, the Camino picks up a quaint lane, shown below. This is a lovely, but short-lived reprieve from the AC-453. At the end of the lane, you rejoin the AC-453 and stay on it for another long 1.28 kilometers. 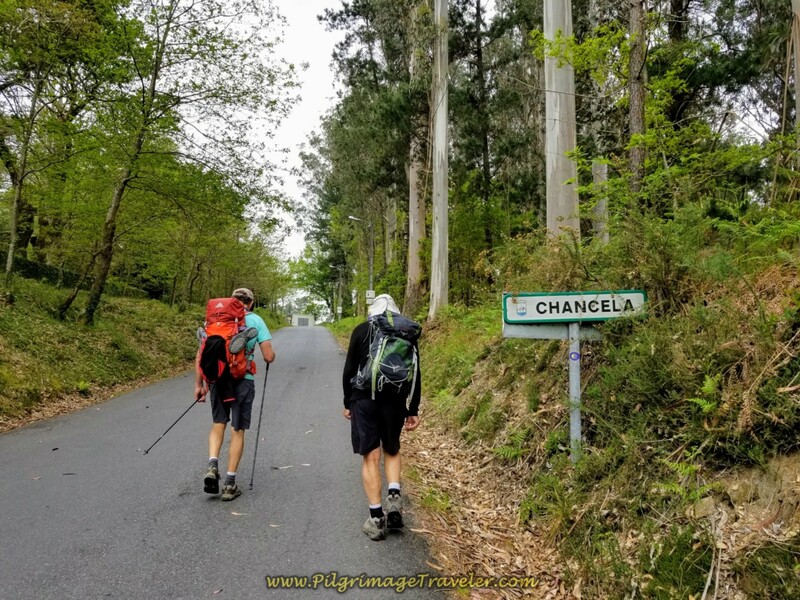 The good news is that you are descending steeply on pavement instead of climbing, skirting by the town of Castelo, then onward to Augapesada. See that hill ahead in the photo below? 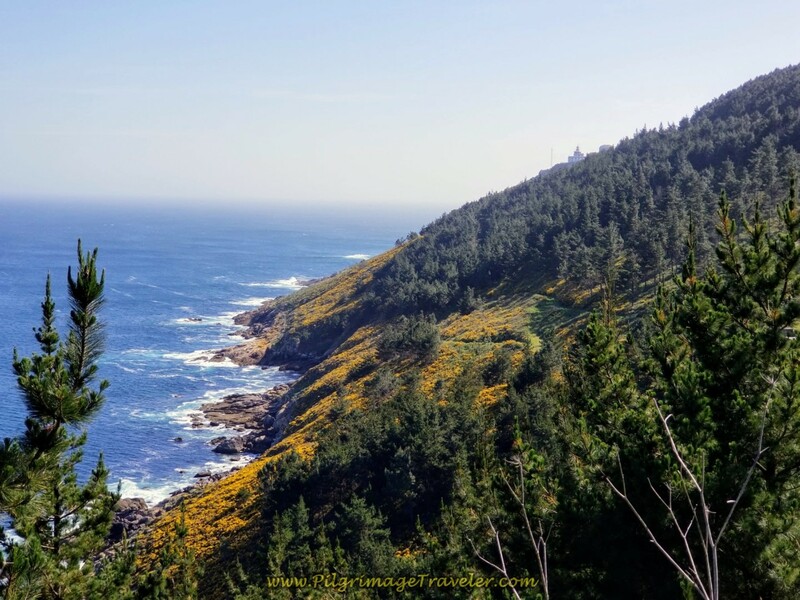 Enjoy the downhill cruise, because you will be climbing that soon! 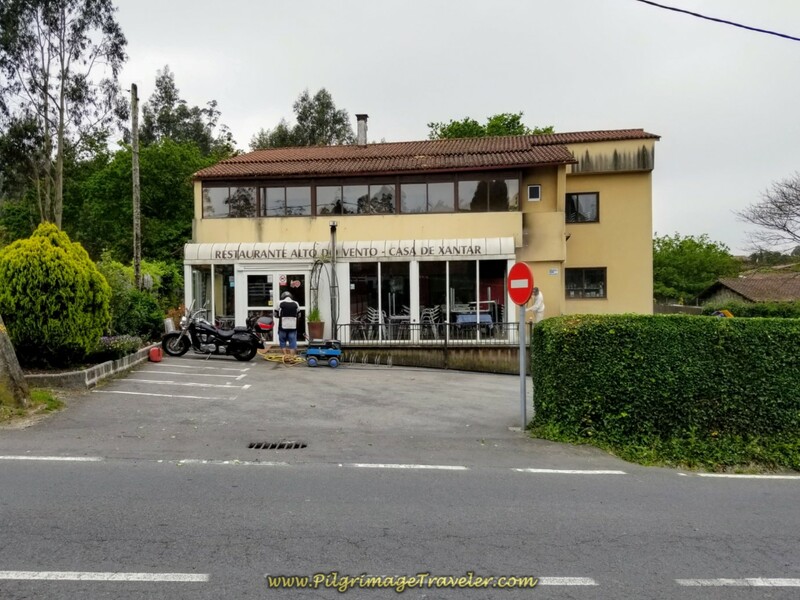 The other good news is that there is a nice café called the Parrillada O Cruceiro, below, just before the 79 kilometer waymark, essentially halfway into the day, and just before the long hill climb out of Augapesada. And who should we see sitting outside as we walked up to the café? Our two friends, Rob and Steve. We joined them for more coffee and a bocadillo this time. Why not? This halfway point is a fabulous place to fuel up before the big climb ahead of you! 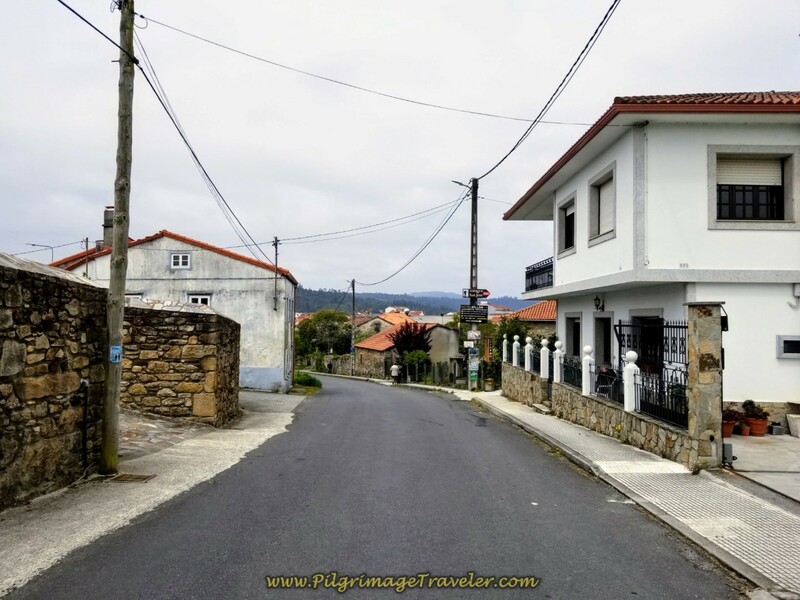 If you want to stay in the area, there is a casa rural, the Casa Riamonte in Castelo, just before the café, about 1/2 kilometer north of the main road. See the Google map above for its exact location. After our break we traveled onward together, turning left off the AC-453 in 1/4 kilometer after the Parrillada O Cruceiro, at this juncture, below. You can see the additional signage painted on the road. I guess folks still miss the waymark! Immediately pass, but do not cross this wonderful old bridge. Pause to admire it. After passing the bridge, walk steeply up the hill for 140 meters. Here is Rob, Steve and Rich negotiating the hill climb through Augapesada. Come to an intersection with the CP-0203, cross it, heading straight on and westward to another secondary paved road. 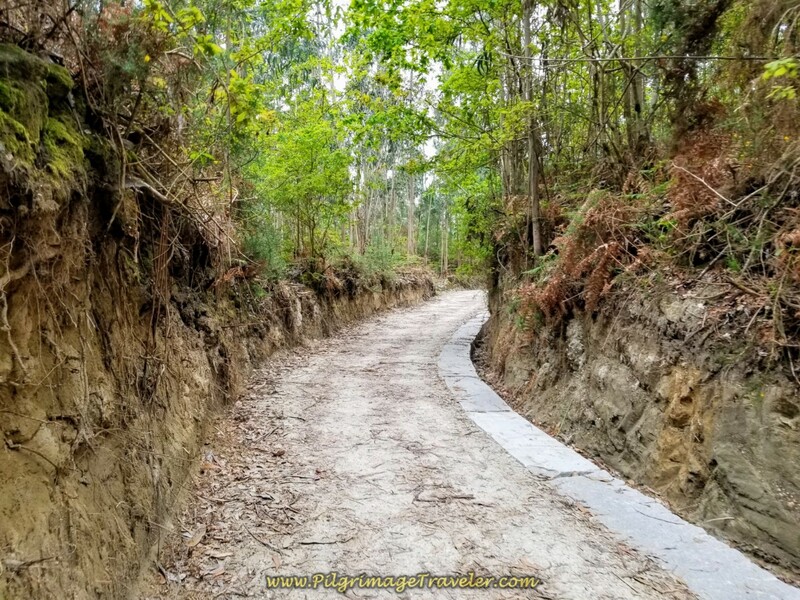 Very soon this road becomes a dirt lane through the forest and a third trail system on day one of the Camiño Fisterra! 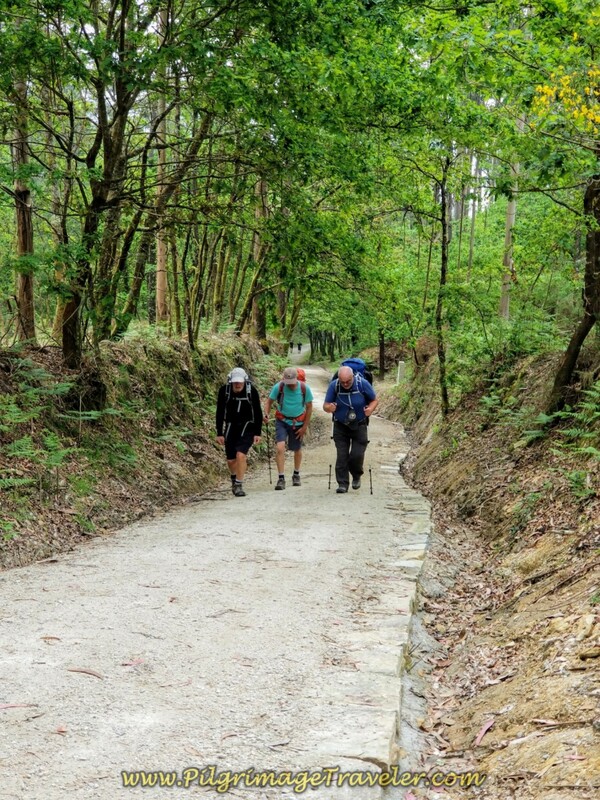 You can see that as the trail gets steeper, it is nicely improved to prevent erosion in this rainy Galician climate. I call this forest section the enchanted forest, because it reminded me of something straight out of Tolkien! Here are two great photos of it. You will feel this climb! Here is Steve walking on by a resting bench on the way up! You will encounter several of these benches along the climb. 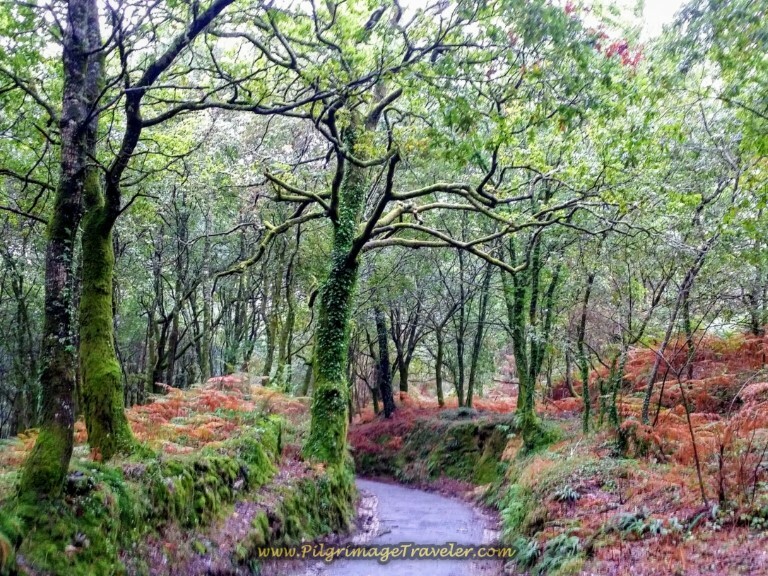 It is at least 1.5 kilometers on the forest path when the Way merges with a paved secondary road that heads the pilgrimage traveler toward the next town of Carballo. The climbing does not cease with the merging of the road! 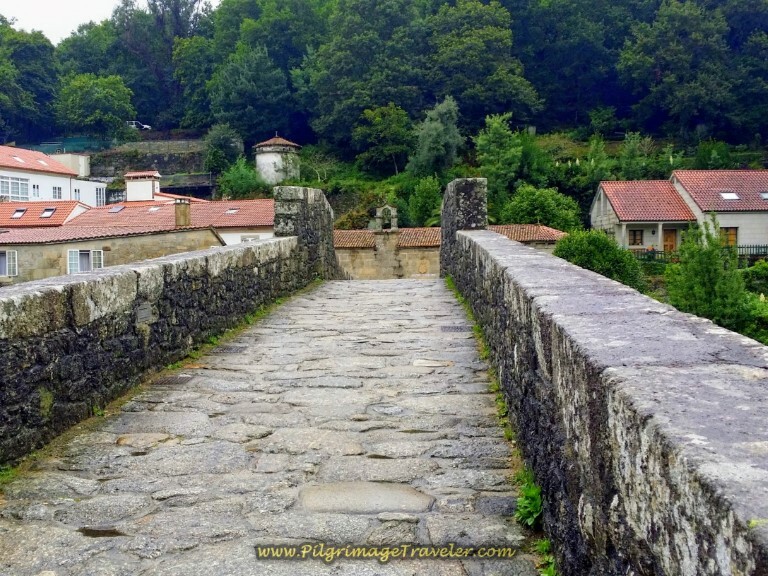 It continues to climb, past a cool fountain, below, and all the way to Carballo, not quite a kilometer farther on! When you see the radio tower, (not pictured), you will know you are at the top! 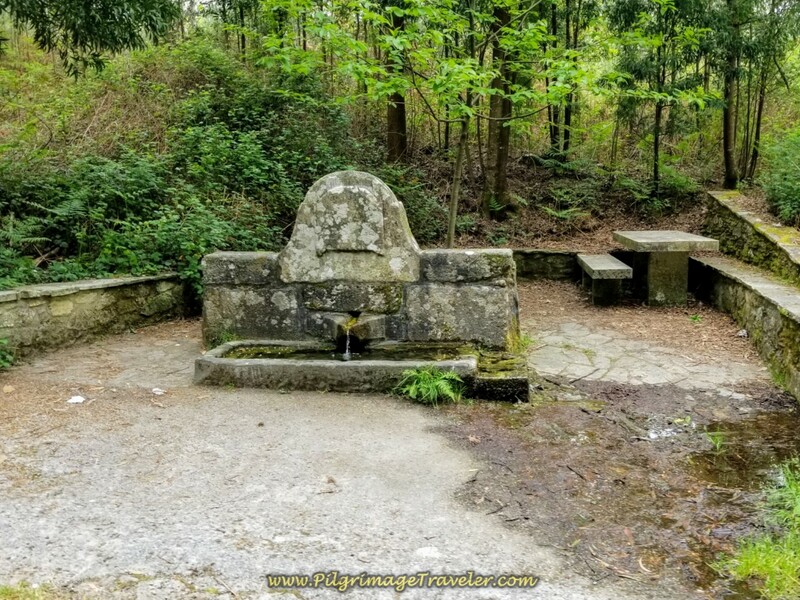 You could stop and rest here at this lovely fountain, as it is only a few hundred meters from the top. The steep climb is approximately 2.25 kilometers in total. 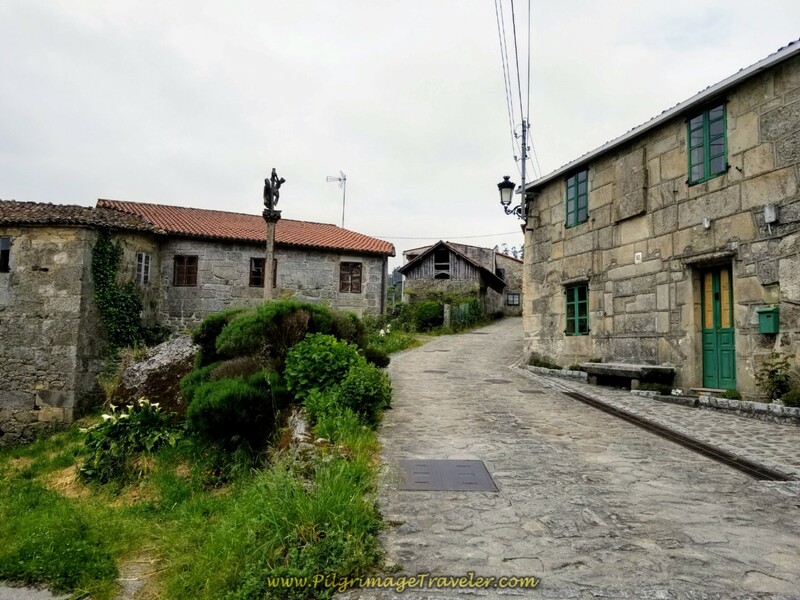 Carballo is just beyond the summit. 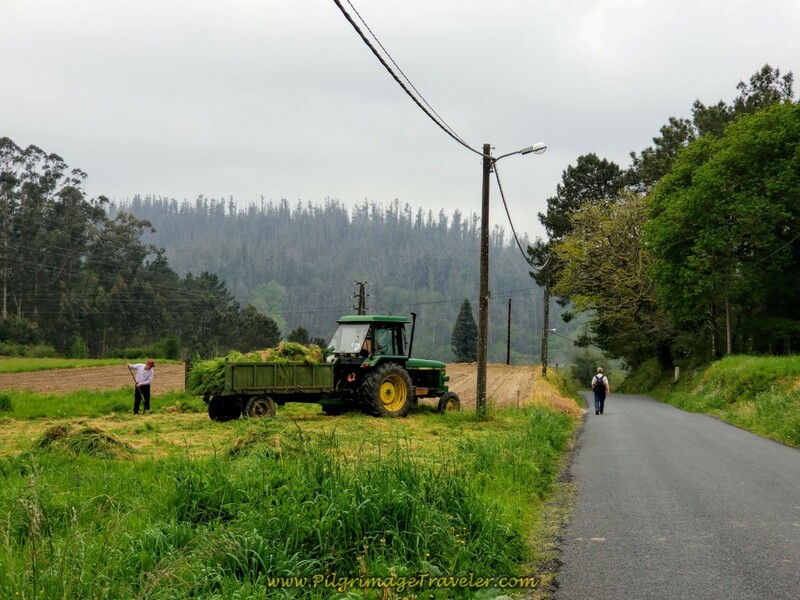 Continue your walk through the lovely Galician countryside and through additional farm land. 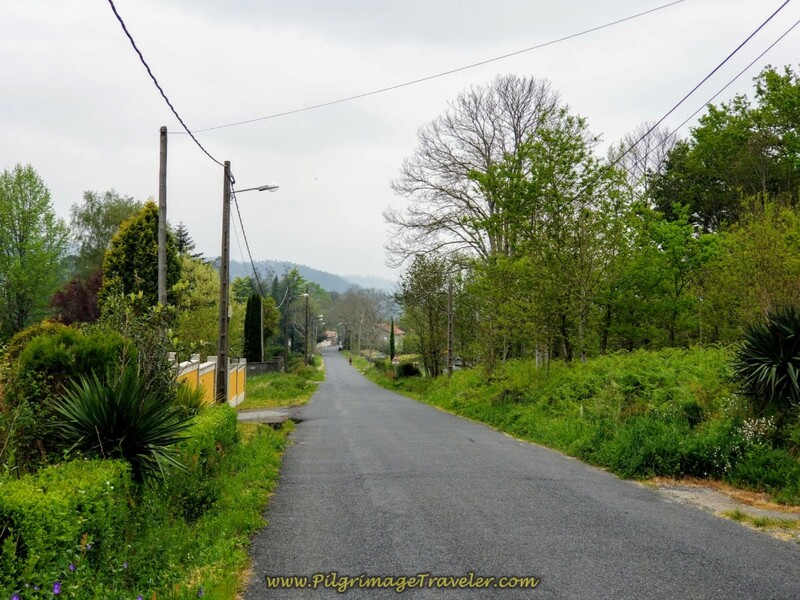 Pass the café, the Casa Poncho in about a kilometer onward from Carballo, not pictured. Start your descent toward the Río Tambre. Pass a sign for the hamlet of Reino. The Way is enjoyably easy through here! 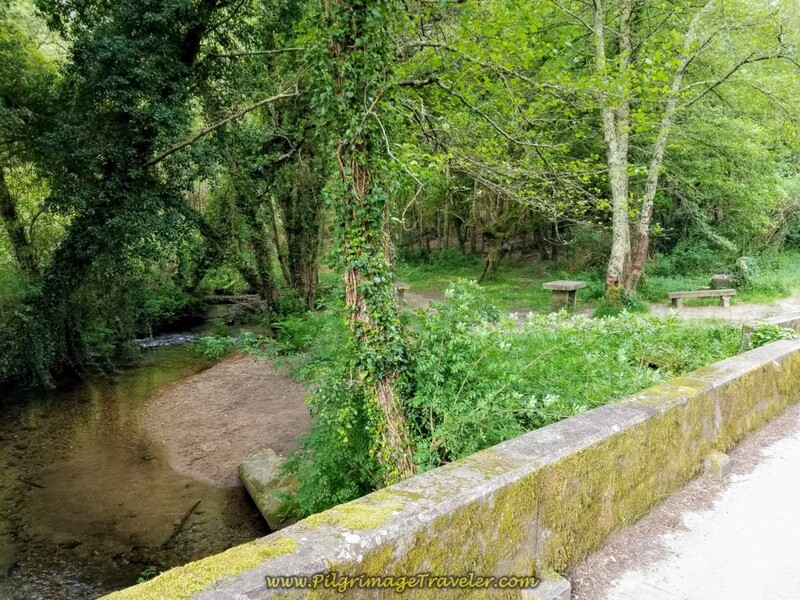 Next pass a sign for the hamlet of Burgeiros and walk through another enchanted forest area, shown below, on your way to the famous, mostly 13th century bridge, the Ponte Maceira! 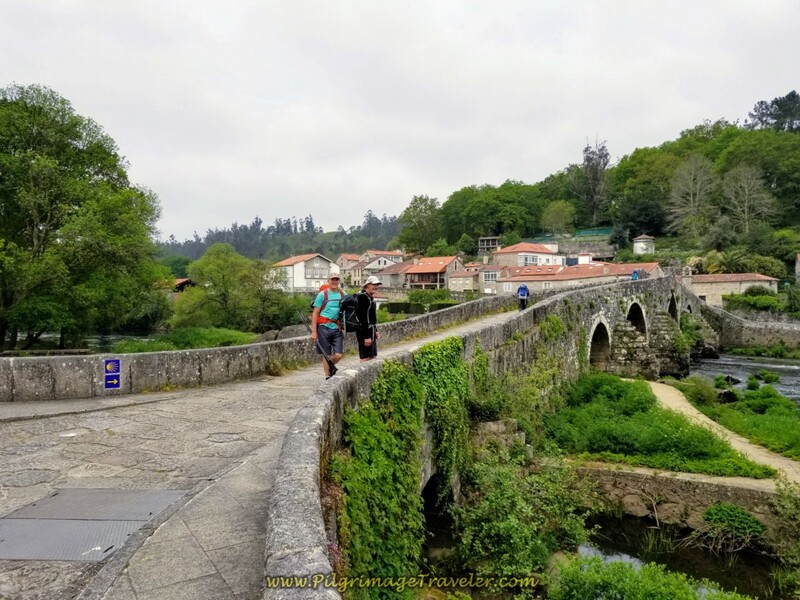 In about 1.8 kilometers from the Casa Poncho, the Camino enters the town of Ponte Maceira turns to the left by the Restaurante Ponte Maceira, and bends right to cross the Río Tambre on the bridge. This is a wonderful place! It is so inviting and I always say the next time, I will spend more time here. Well, I did spend more time here on this trip, but it still did not seem like enough. Too bad the restaurant wasn't open when we walked by. I would have loved to have had a café con leche in their outdoor seating area and lingered longer. 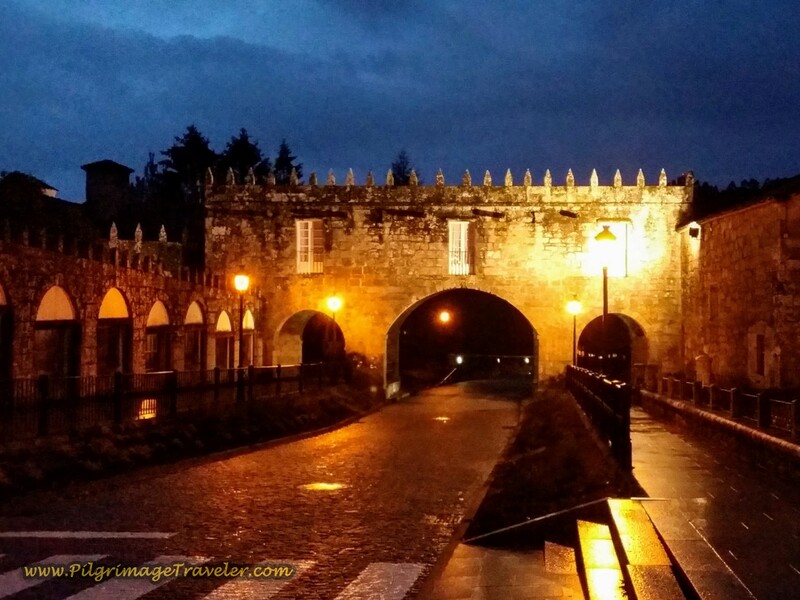 When you arrive at the bridge, you are only 3.8 kilometers from the center of Negreira, so if you can linger in Ponte Maceira, do! It is more lovely and mystical here than in Negreira. It is a perfect place to ponder the all-too-soon ending of your journey. Relish your time here. If you wish to read more about this bridge and environs, click here. 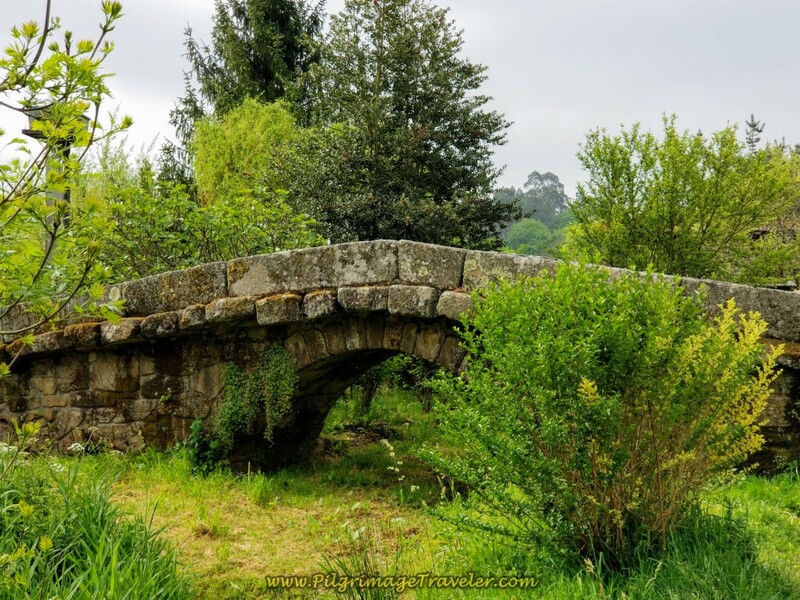 As is usual of all these old bridges, the origins are Roman, followed by many updates, the most recent one in the 1700's according to the website. After walking across the bridge, the Way bears left and up the hill through town, shown below. 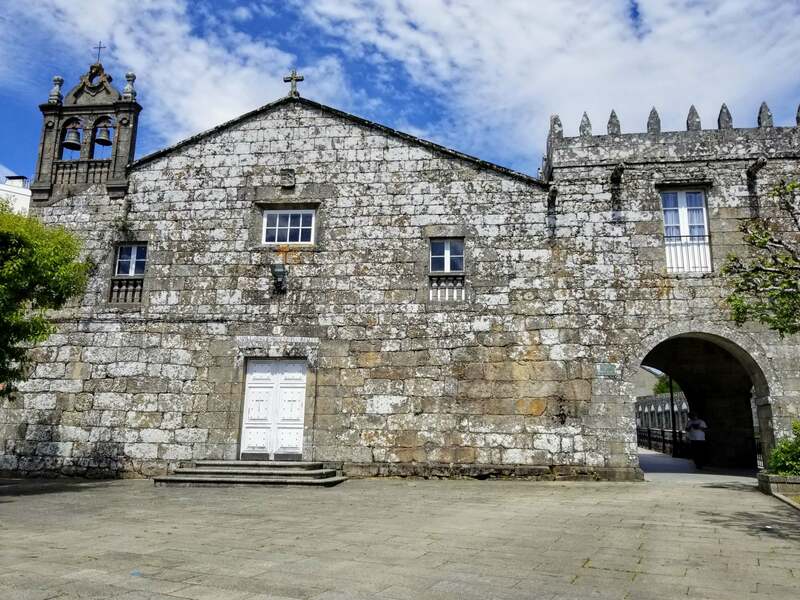 There are many old stone buildings of interest in this little town including the 18 century chapel at the end of the bridge, the Ermida de San Brais, or San Blas. You can see its bell tower in the photo above. 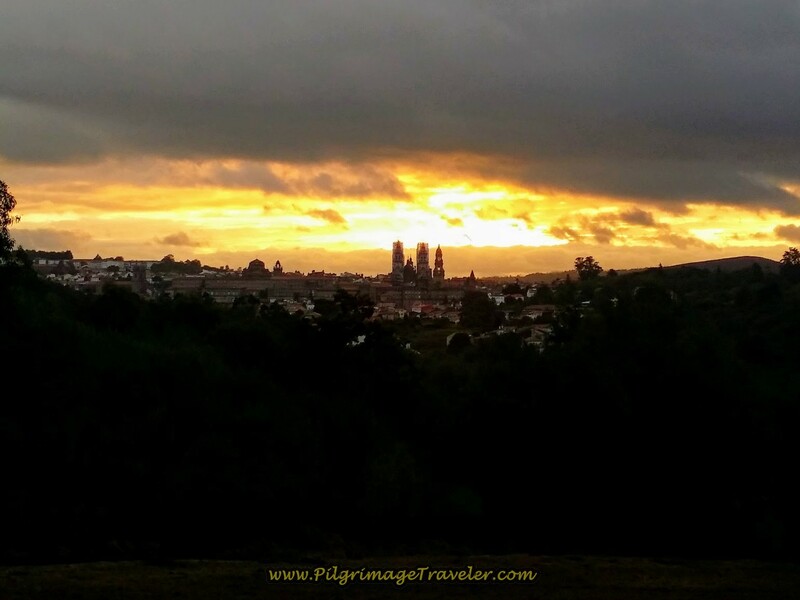 The cruceiro shown below seems to beckon the pilgrimage traveler up the hill. In 1/2 kilometer more, turn left onto this path, at the 72 kilometer marker as it descends down to the Tambre River once again. 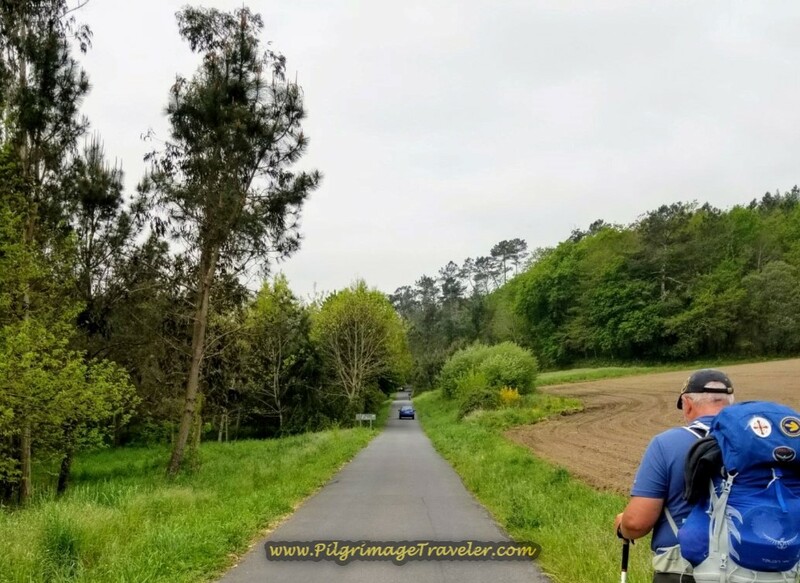 Walk under another overpass of the AC-544 and pick up this nice lane through fields on the way to the next hamlet of Barca. This off-pavement section is brief, but does continue on for about 3/4 kilometer, before joining the AC-447, shown below. Only 1/4 kilometer of walking is required on the AC-447 before the Way picks up a parallel side road to the north of the highway for another 1/3 kilometer. 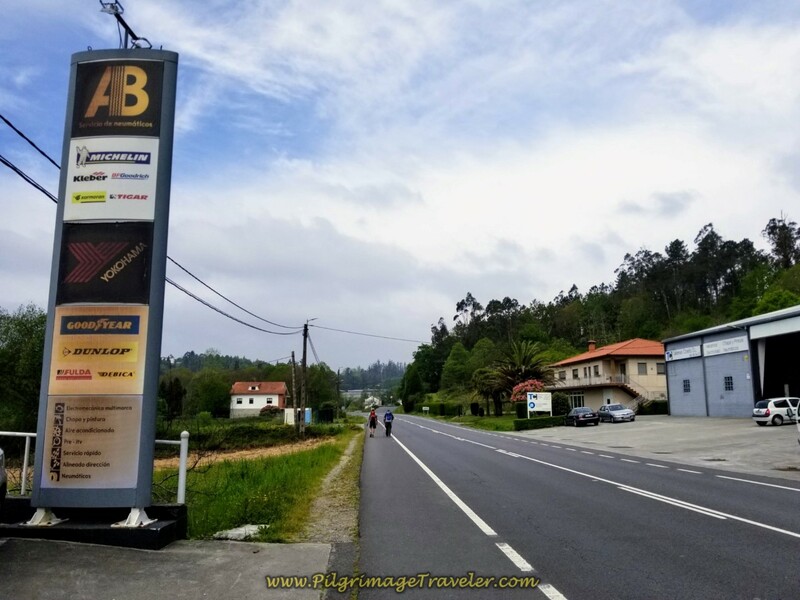 Continuing to avoid the busy road, the Camino then crosses the AC-447 to pick up another quieter road, shown below. Ahead of you on the final kilometers of the day is yet one more climb, lasting about 500 meters. It is steep, but at least it is short! Here is Steve and Rich heading up the hill toward the next town of Chancela. It is 3/4 kilometer from the turnoff in Barca to the top of the climb in Chancela on these quiet paved roads. Walk directly by the private Albergue Anjana in Chancela. Just before entering the city limits of Negreira, you know you are getting close when signs for accommodations begin to appear. 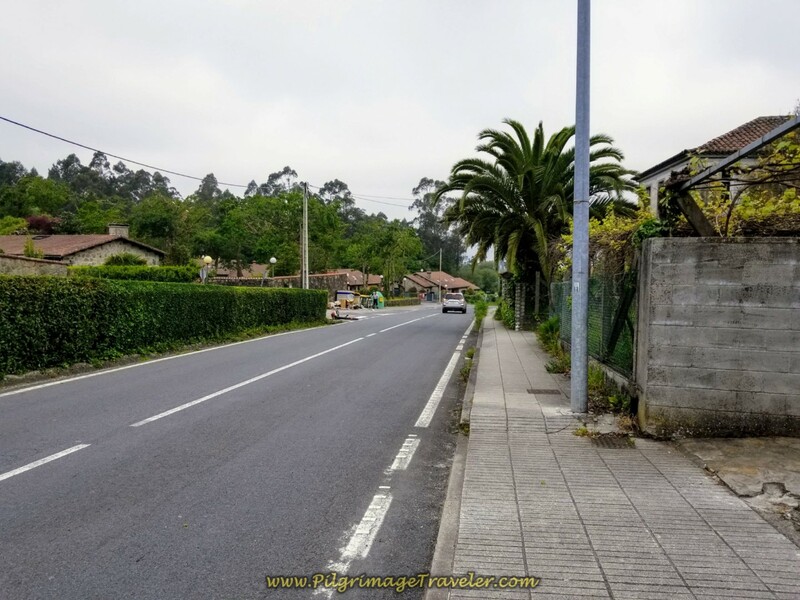 The first signs you come to are for the Albergue Turistico de Logroso, 3/4 kilometer south in Logroso, the Hotel Millán and the Albergue San José. Turn at the signs if that is your destination. After the signs above, descend steeply into Negreira itself and come to a T-intersection with the AC-447 in the center of town. 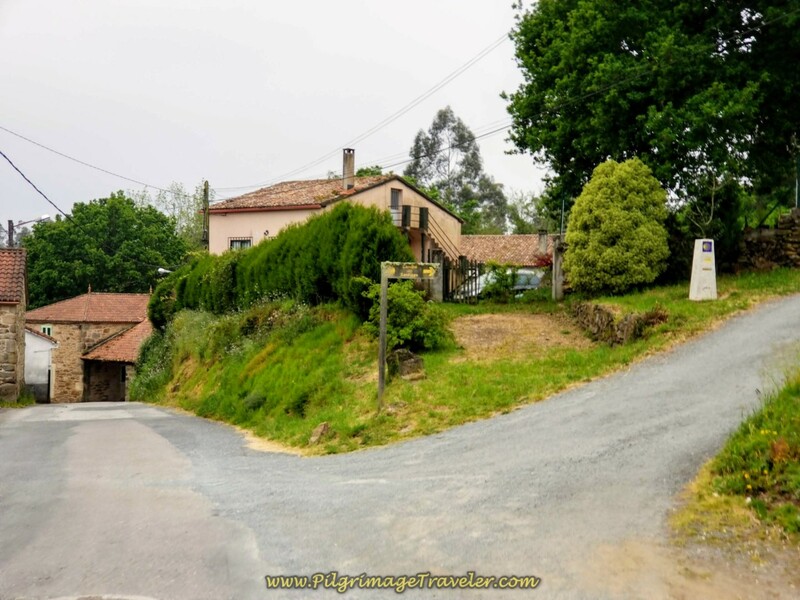 It is another 1/2 kilometer walk from the top of the final hill climb in Chancela to this intersection. Here you will encounter many more signs and the 69.93 kilometer marker, below. 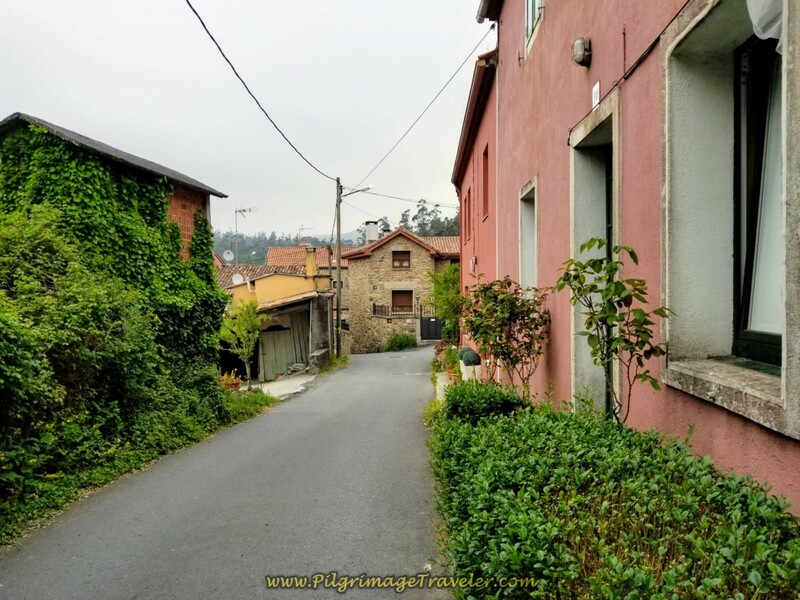 I have stayed in the Albergue Alecrin, just a few meters to the right on the AC-447, a comfortable enough place with kitchen, living and dining communal spaces. 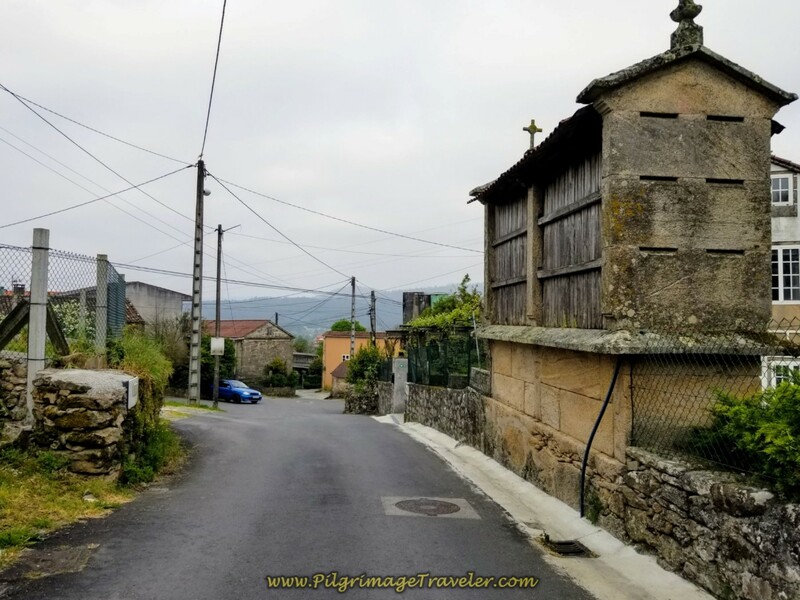 For this trip we turned left, along the AC-447 and up the hill to find the Hostal Pensión La Mezquita, 300 meters farther along the Camino. The Albergue Lua is along this section as well on your left as you climb the hill. Around the bend at the top of the hill is the Hostal Pensión La Mezquita, shown below. 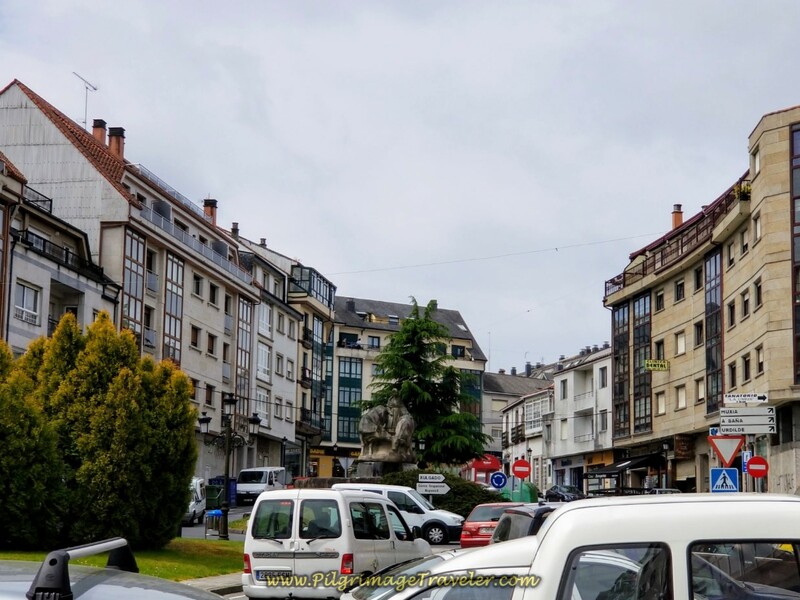 The Camino goes left here, and the hostal is on the corner on the right. 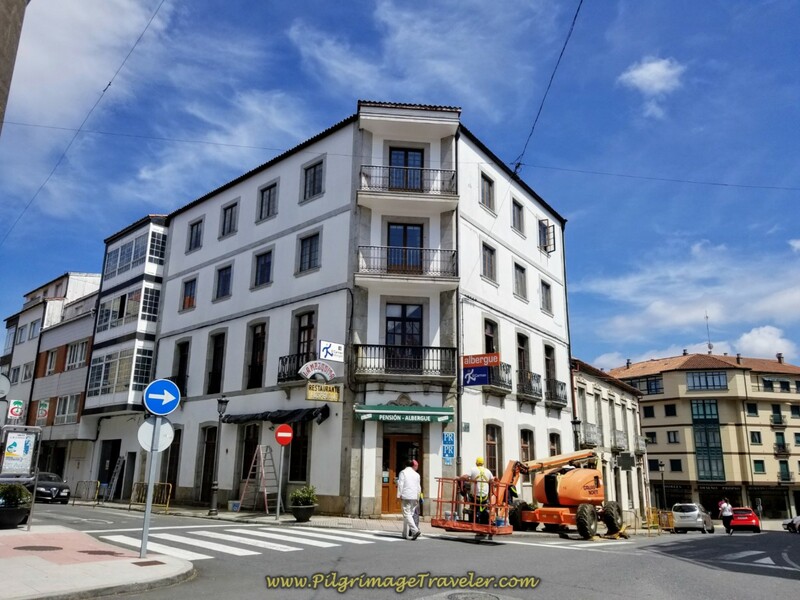 This is a very comfortable hotel, and Rich and I splurged on a room with a king-size bed, a true rarity on the Camino, for 50 Euro and a huge buffet breakfast included. They also served a delicious pilgrim's menu dinner for only 10 Euros each. There is also an albergue here, called the Albergue El Carmen, within the same building. There is no kitchen, but there is a cafeteria, with inexpensive meals. 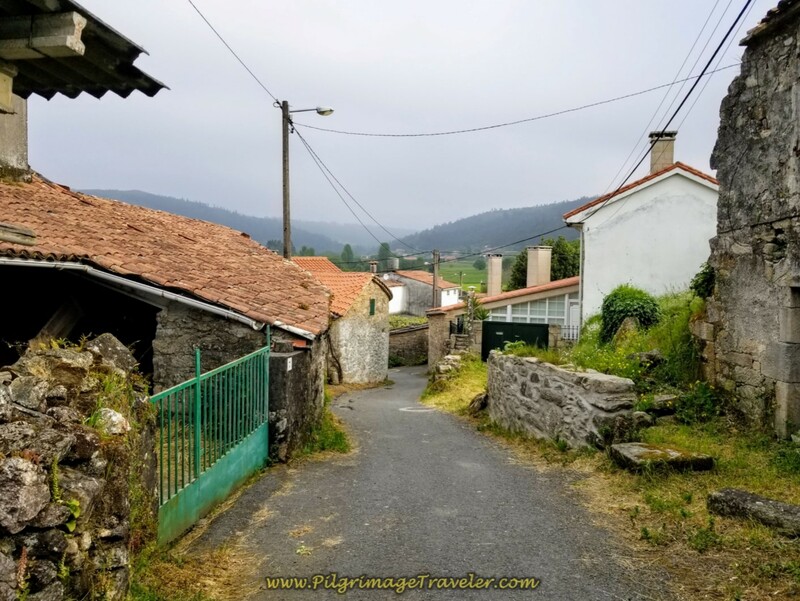 There is a municipal albergue, The Albergue de Peregrinos de Negreira, another one kilometer onward, and outside of town, right along the Way if you want to make it there. Please consult our Google map above to see the location of all these accommodations. 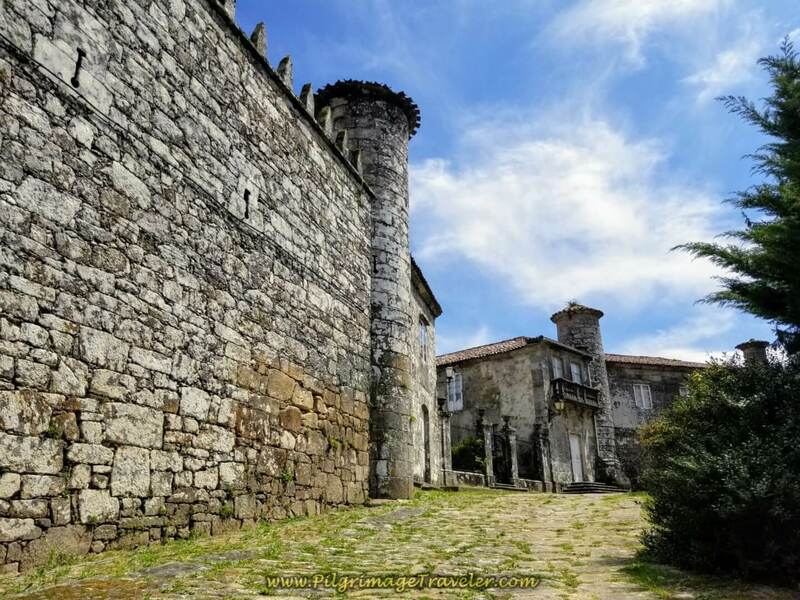 After we cleaned up, did our laundry and had a beer, we toured the main attraction of Negreira, the Pazo do Cotón. 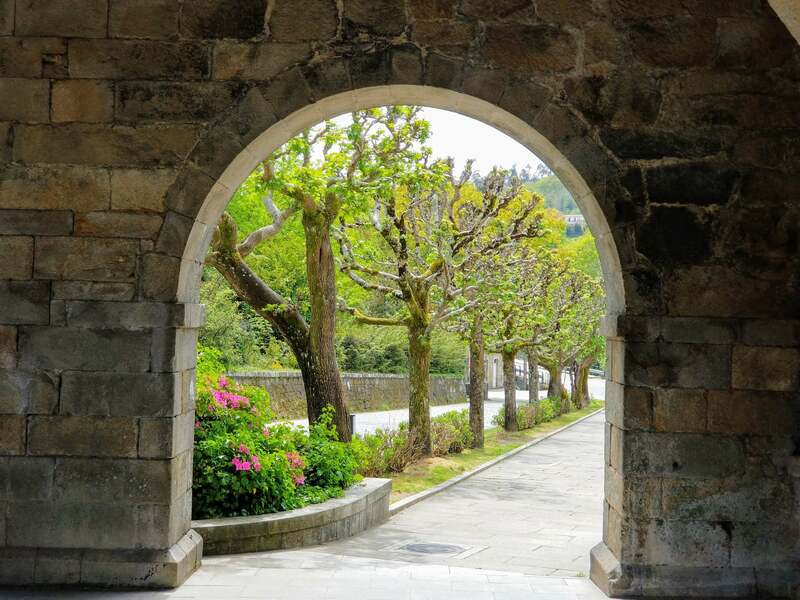 Originally a medieval fortress, designed for military purposes, it has undergone many updates in the recent centuries. It is a lovely building nonetheless. 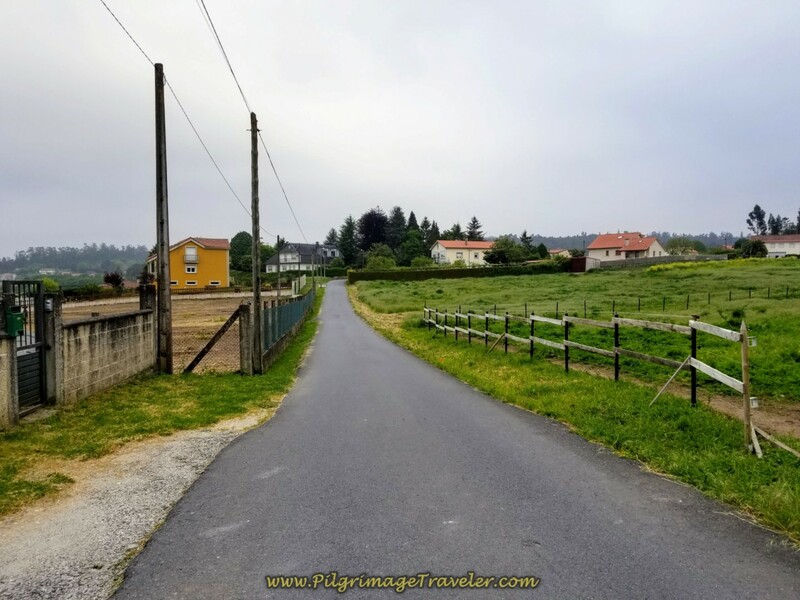 Below is the gate, where the Camino walks through as it leaves town and heads onward on day two. The spring leafing-out trees along the road were framed beautifully by the gate. 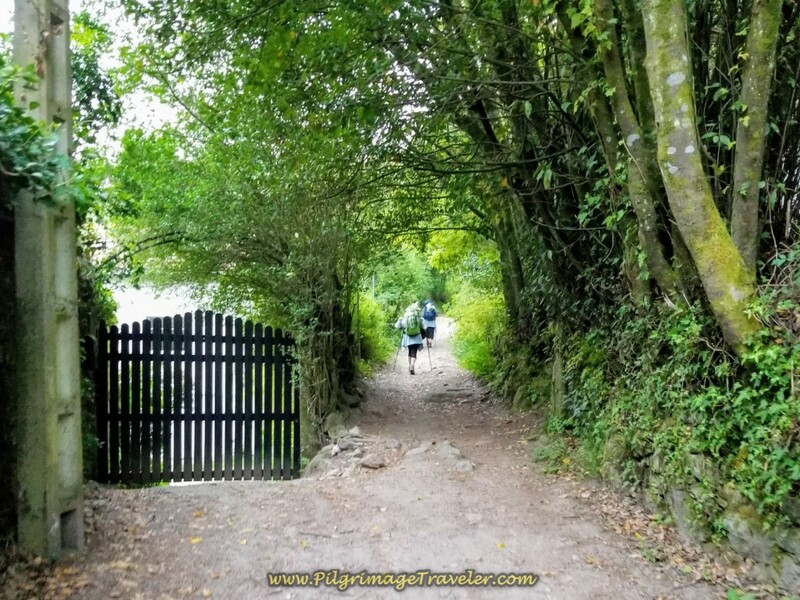 This is the way onward for the Camino, through this gate on the DP-5601. We would start here the next day. As far as I know, this palace is not a museum. I believe this is the main residence area with its entrance on the outside of the city wall. The medieval fortress tour was a perfect ending to a Tolkien-like day! It is worth the short walk up the hill to go see it. 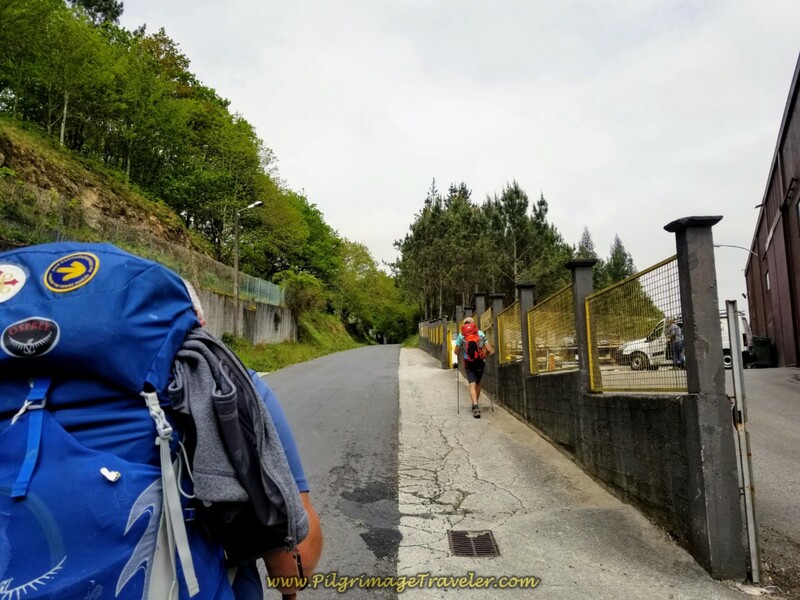 Even though this travelogue shows my journey with my husband and friends, the first time I had the pleasure of walking it alone. 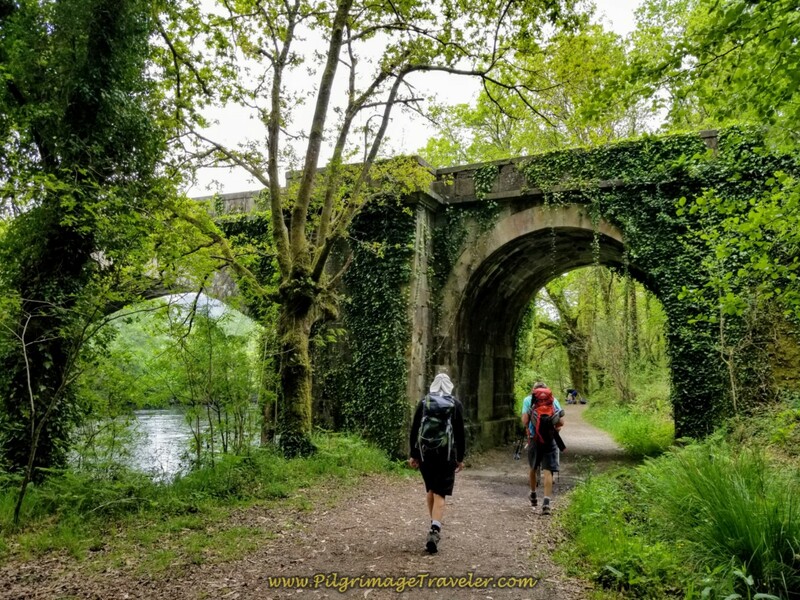 On my first trip through here, this day one of my Camino Finisterre was about seeing what was ahead, becoming the adventuress that I had always wanted to be, even since I was a child. 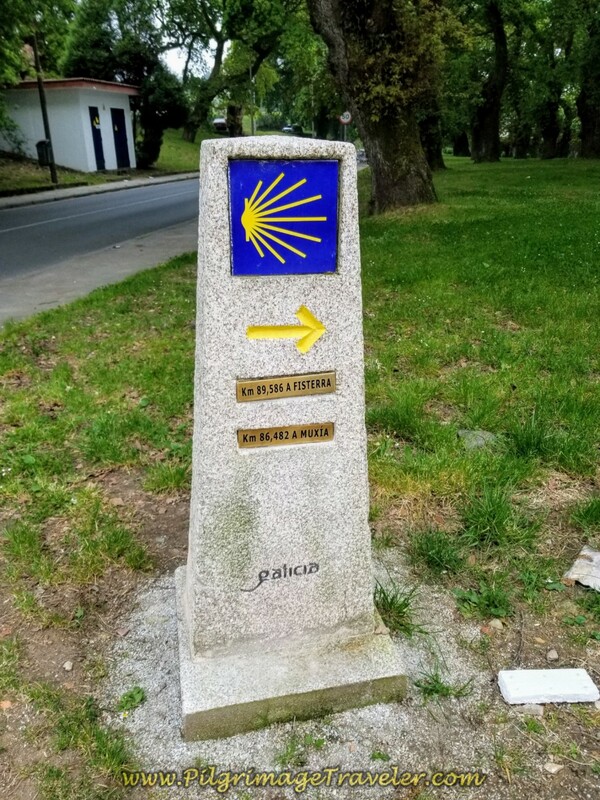 I was walking a Camino alone for the first time and this was a brand new thing for me! I have often wondered, as long as I can remember, when I am on a road, where did it go? Where did it end? What would happen if I just stayed on this road until it ended? I allowed this spirit, deep in me, to finally surface. 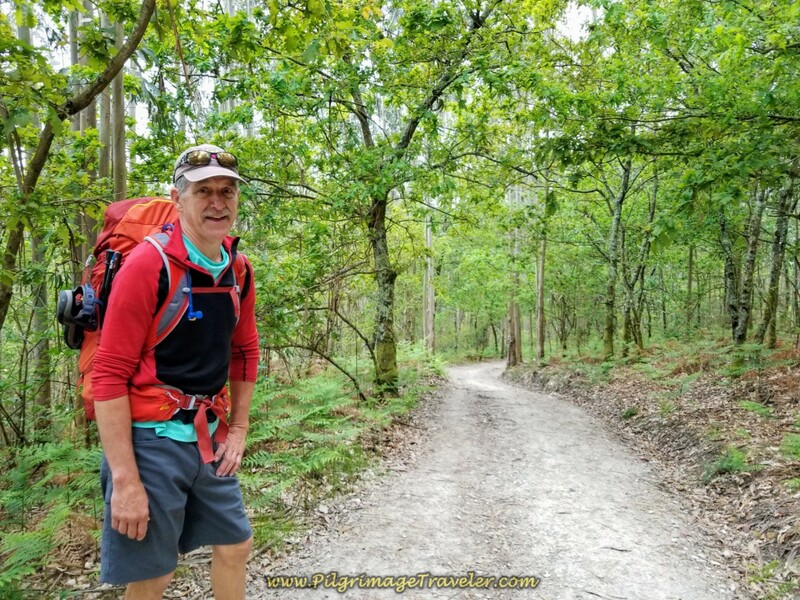 This spirit of adventure is deeply attractive to me and I could see why the constant movement of the physical and spiritual journey could become addictive. 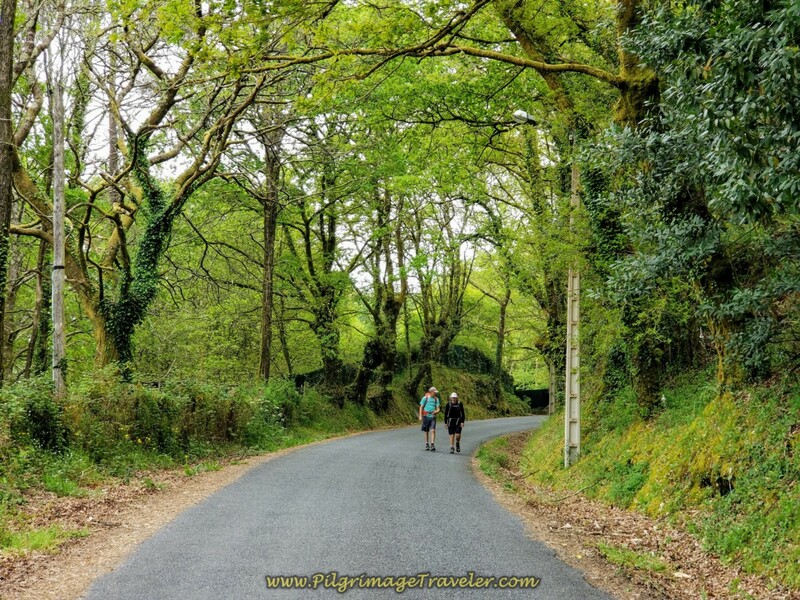 Doing the Camino alone, is very interesting, shall I say, because you really don't know what's around the bend. You gotta go see! And trust that what you see is just what it is! And what is, is there for YOU! 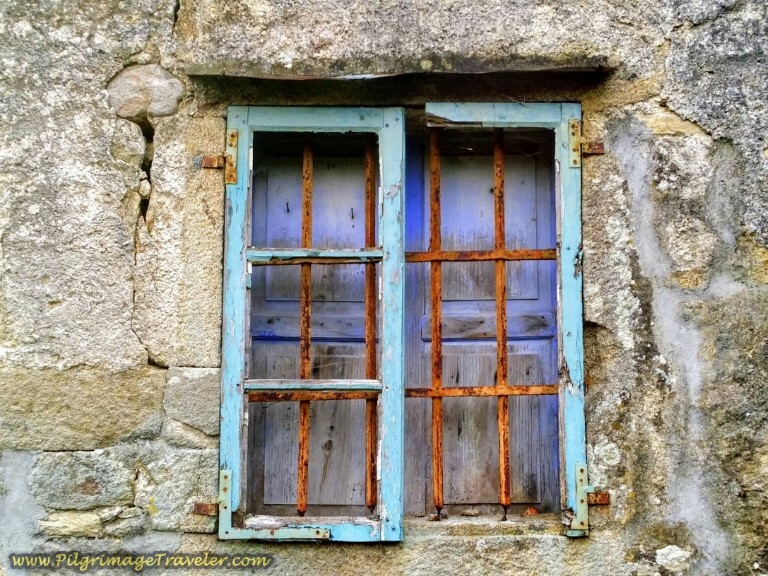 Open Window along the Finisterre Way ~ A Metaphorical Invitation? 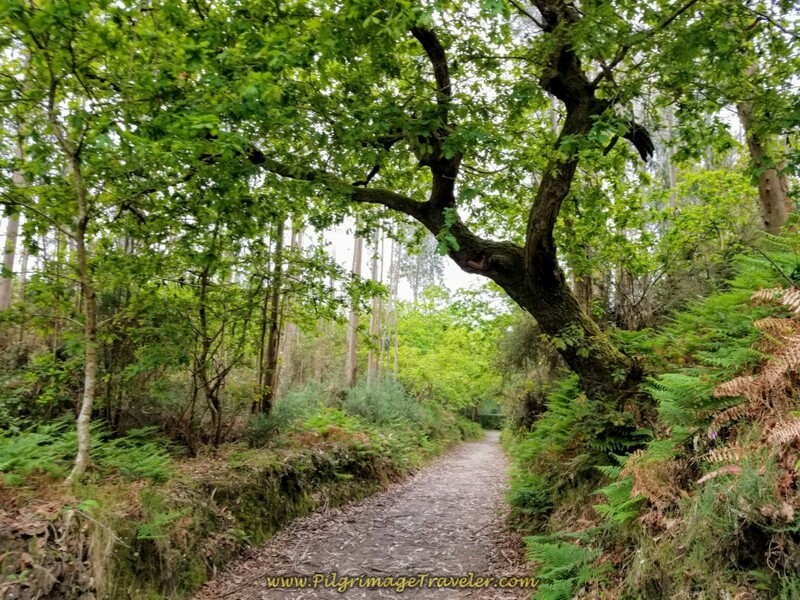 May your own day one on the Camino Finisterre be filled with enchanted forests and a sense of adventure, while following your own road with eager feet! I do hope you decide to do your own extension of your Camino de Santiago to the mystical End of the World. Maybe it will be the "end" of your road or maybe not! And whither then? You cannot say! Ultreia!